On this day in 1016 Edmund Ironside died, after just seven months as king of England. After the death of his father Æthelred on St George's Day 1016, he had inherited a kingdom half-overrun by a Danish army, and he spent most of his reign fighting Cnut and the Danes for control of England. The last battle was fought at Assandun on 18 October 1016, after which Edmund and Cnut reached a peace-treaty and agreed to divide the kingdom - so at the time of his death Edmund was king only of Wessex, while Cnut held what the Anglo-Saxon Chronicle calls the norðdæle, the northern part of England. Following Edmund's death, as the peace-treaty may have arranged, Cnut became king of the whole country, and went on to rule it for nearly twenty years. The Anglo-Saxon Chronicle only observes that Edmund died on St Andrew's Day and was buried with his grandfather, King Edgar, at Glastonbury. It gives no details as to the location or manner of his death, and later sources provide varying information on both. 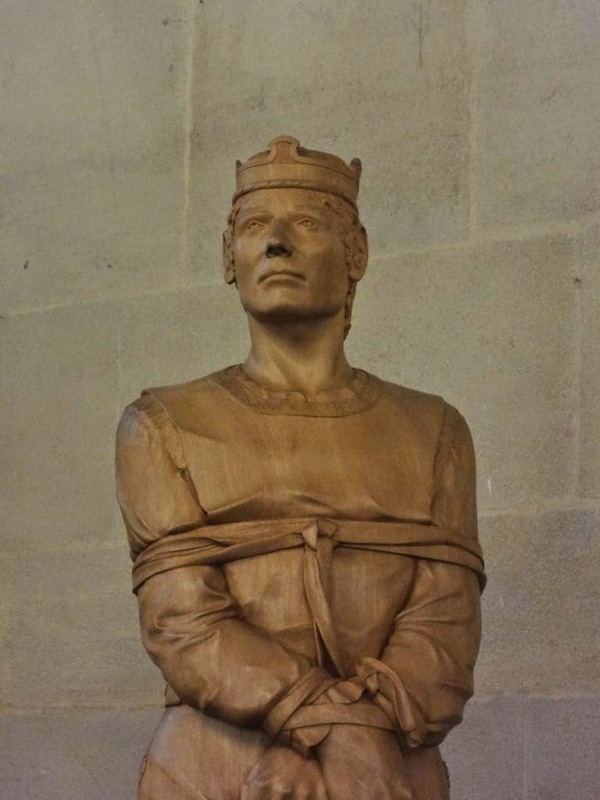 Some sources say he died in Oxford (which was near the northern border of his much-diminished kingdom), others in London (then occupied by Danish ships). We don't know the cause of his death, and it may well have been from natural causes: he died at the end of a year of almost continuous warfare, just six weeks after a heroic performance at the Battle of Assandun, so it's very possible he succumbed to an existing wound. But this simple explanation seems not to have appealed to contemporaries or to later medieval historians. Within a few decades (and perhaps from the first) his death was being blamed on Eadric streona, one of his commanders, a Mercian ealdorman of impressively fluid loyalties. Eadric had betrayed Edmund in the past, and switched allegiance between the Danes and the English and back again more than once in the years before Edmund's death. The Anglo-Saxon Chronicle regularly highlights his betrayals, and post-Conquest sources blackened his already pitch-black name by crediting him with a whole range of extra crimes, including but not limited to the St Brice's Day Massacre, the murder of Svein Forkbeard's sister Gunnhild, the death of St Ælfheah, the English defeat in more than one battle against the Danes, and the murder of Edmund. 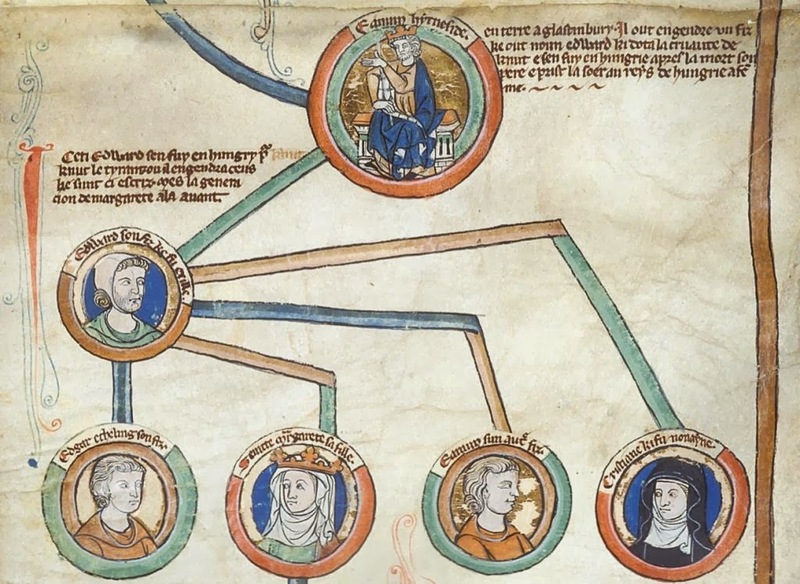 The twelfth-century historians are pretty well agreed that Eadric was largely to blame for the Danish Conquest, and if they could have found some way to blame the Norman Conquest on Eadric, they would probably have done that too. Perhaps surprisingly, no English sources cast suspicion on Cnut or suggest he was involved in his rival's death - quite the opposite, in fact. 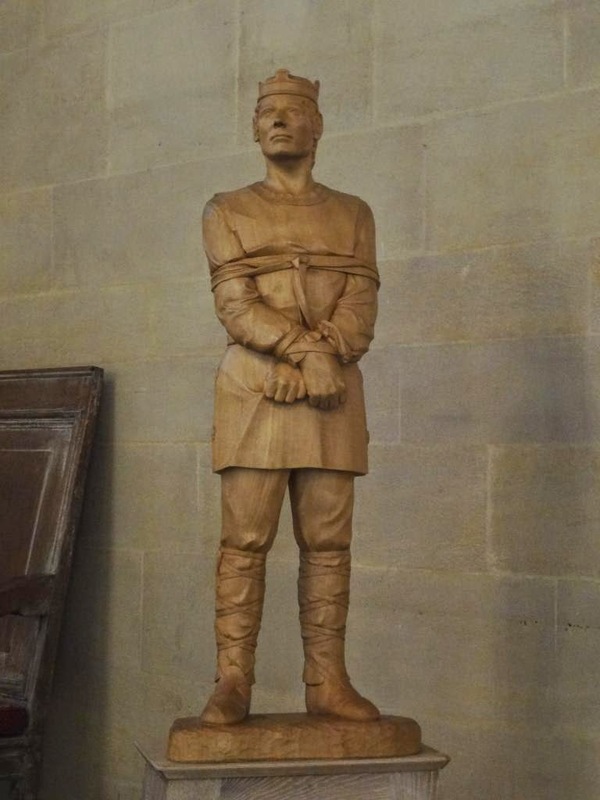 Cnut was not above executing political opponents (including one of Edmund's brothers, and his own brother-in-law) so it would hardly have been out of the question, and some late Scandinavian sources have no doubt Cnut was responsible. The English historians, however, tell a very different story. The treaty made between Cnut and Edmund, illustrated by their kiss of peace in the thirteenth-century manuscript above, had made them 'partners and pledged-brothers' (feolagan 7 wedbroðra), and William of Malmesbury says that Cnut continued to refer to Edmund as his brother; he even visited Edmund's grave at Glastonbury on the anniversary of his death and presented a rich cloak decorated with peacocks at his tomb. It was, accordingly, the case that he loved those whom he had heard to have fought previously for Eadmund faithfully without deceit, and that he so hated those whom he knew to have been deceitful, and to have hesitated between the two sides with fraudulent tergiversation, that on a certain day he ordered the execution of many chiefs for deceit of this kind. One of these was Eadric, who had fled from the war, and to whom, when he asked for a reward for this from the king, pretending to have done it to ensure his victory, the king said sadly: "Shall you, who have deceived your lord with guile, be capable of being true to me? I will return to you a worthy reward, but I will do so to the end that deception may not subsequently be your pleasure." And summoning Eiríkr, his commander, he said: "Pay this man what we owe him; that is to say, kill him, lest he play us false." He, indeed, raised his axe without delay, and cut off his head with a mighty blow, so that soldiers may learn from this example to be faithful, not faithless, to their kings. Encomium Emmae Reginae, ed. and trans. Alistair Campbell (London: Royal Historical Society, 1949), pp.31-3. When [Edmund], fearful and most formidable to his enemies, was prospering in his kingdom, he went one night to the lavatory to answer a call of nature. There the son of Ealdorman Eadric, who by his father's plan was concealed in the pit of the privy, struck the king twice with a sharp knife in the private parts, and leaving the weapon in his bowels, fled away. Then Eadric came to King Cnut and saluted him, saying, ‘Hail, sole king!’ When he disclosed what had happened, the king answered, ‘As a reward for your great service, I shall make you higher than all the English nobles.’ Then he ordered him to be beheaded, and his head to be fixed on a stake on London’s highest tower. Henry of Huntingdon, Historia Anglorum, ed. and trans. by Diana Greenway (Oxford: Clarendon Press, 1996), pp.360-3. 'Higher', get it? Justice with a pun. This story, puns and privies and all, is actually quite a restrained version: as time went on, other medieval historians added lurid details about some kind of bizarre privy-based stabbing machine which Eadric used to kill Edmund, yet more puns about reward/debt/being made 'highest', and Cnut throwing Eadric into the Thames with a catapult. See, and you thought medieval history was boring. Anyway, we will piously hope that this was not actually how Edmund Ironside, valiant scion of the great kings of Wessex, really met his untimely end. Whatever vengeance Cnut may or may not have enacted on his behalf, history did bring him a measure of justice. At the time of his death, he had two infant sons by his wife Ealdgyth. They were taken out of the country, and grew up in exile. 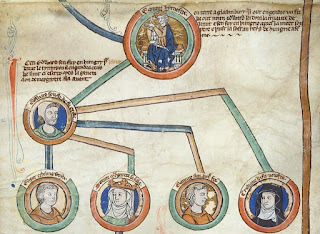 One of them married a Hungarian princess and by her became the father of three children, including Margaret of Scotland; and her daughter, in 1100, married Henry I, thus grafting the line of the Anglo-Saxon kings back into the royal family tree. So it's through Edmund Ironside, though only seven months' king, that the English monarchy can today claim descent from the kings of Wessex. Þyses dæges þenung and ðyssere tide mærð sprecað embe Godes tocyme. Þeos tid oð midne winter is gecweden, Aduentus Domini, þæt is Drihtnes tocyme. His tocyme is his menniscnys. He com to us ðaða he genam ure gecynd to his ælmihtigan godcundnysse, to ði þæt he us fram deofles anwealde alysde. 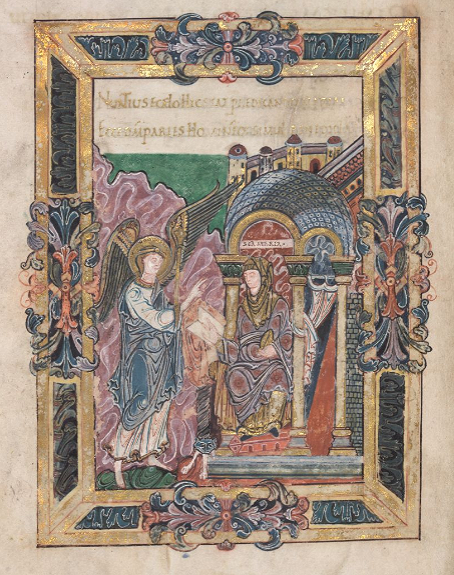 This is the opening of a homily for the First Sunday of Advent by the Anglo-Saxon homilist Ælfric, who, as you can see, translates adventus with the literal English equivalent tocyme (to-coming). 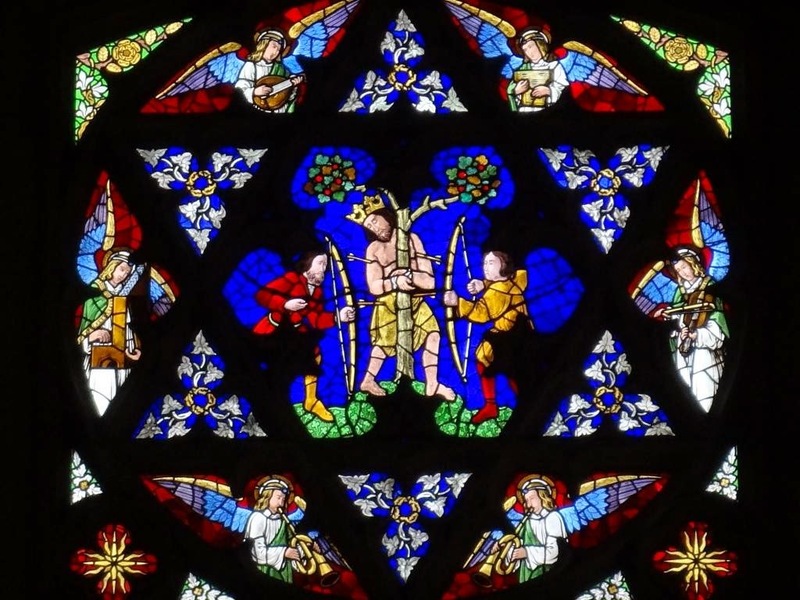 He goes on to describe the season of Advent, and to reflect on one of the readings for the day, St Paul's exhortation from Romans 13: Seo niht gewat, and se dæg genealæhte. Uton awurpan ðeostra weorc, and beon ymbscrydde mid leohtes wæpnum. 'The night is passed, and the day approaches. Let us cast away the works of darkness, and be clothed with the weapons of light'. Nu stent se gewuna on Godes gelaðunge, þæt ealle Godes ðeowan on cyrclicum ðenungum, ægðer ge on halgum rædingum ge on gedremum lofsangum, ðæra witegena gyddunga singallice on þyssere tide reccað. Þa witegan, þurh Godes Gast, witegodon Cristes tocyme ðurh menniscnysse, and be ðam manega bec setton, ða ðe we nu oferrædað æt Godes ðeowdome ætforan his gebyrdtide, him to wurðmynte, þæt he us swa mildheortlice geneosian wolde. Crist com on ðam timan to mancynne gesewenlice, ac he bið æfre ungesewenlice mid his gecorenum þeowum, swa swa he sylf behet, þus cweðende, "Efne ic beo mid eow eallum dagum, oð þissere worulde gefyllednysse." Mid ðisum wordum he geswutelode þæt æfre beoð, oð middangeardes geendunge, him gecorene menn, ðe þæs wyrðe beoð þæt hi Godes wununge mid him habban moton. Þa halgan witegan witegodon ægðer ge ðone ærran tocyme on ðære acennednysse, and eac ðone æftran æt ðam micclum dome. We eac, Godes ðeowas, getrymmað urne geleafan mid þyssere tide þenungum, forðan ðe we on urum lofsangum geandettað ure alysednysse þurh his ærran tocyme, and we us sylfe maniað þæt we on his æftran tocyme gearwe beon, þæt we moton fram ðam dome him folgian to ðam ecan life, swa swa he us behet. Be ðyssere tide mærsunge spræc se apostol Paulus on ðyssere pistol-rædinge to Romaniscum leodum, and eac to eallum geleaffullum mannum, þus manigende, "Mine gebroðra, wite ge þæt nu is tima us of slæpe to arisenne: ure hæl is gehendre þonne we gelyfdon. Seo niht gewat, and se dæg genealæhte. Uton awurpan ðeostra weorc, and beon ymbscrydde mid leohtes wæpnum, swa þæt we on dæge arwurðlice faron; na on oferætum and druncennyssum, na on forligerbeddum and unclænnyssum, na on geflite and andan; ac beoð ymbscrydde þurh Drihten Hælend Crist." 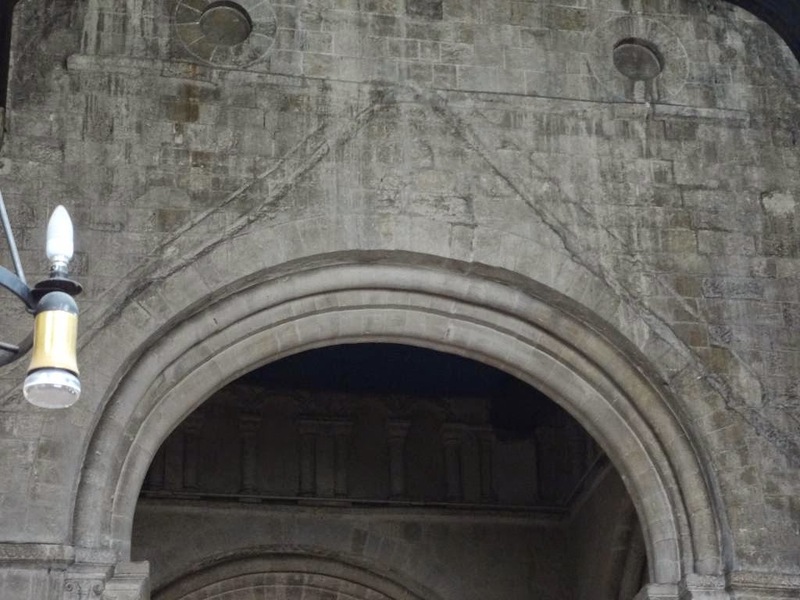 Se apostol us awrehte þæt we of slæpe ure asolcennysse and ungeleaffulnysse æt sumon sæle arison, swa swa ge on ðyssere andwerdan rædinge gehyrdon. "Mine gebroðra, wite ge þæt nu is tima us of slæpe to arisenne." Witodlice ne gedafenað us þæt we symle hnesce beon on urum geleafan, swa swa ðas merwan cild, ac we sceolon onettan to fulfremedre geðincðe, þurh gehealdsumnysse Godes beboda. We sceolon asceacan ðone sleacan slæp us fram, and deofles weorc forlætan, and gan on leohte, þæt is, on godum weorcum. Gefyrn scean leoht ingehydes geond eorðan ymbhwyrft, and forwel menige scinað on soðfæstnysse wege, þa ðe farað ðurh godspellic siðfæt to ðæs ecan lifes gefean. Efne nu "ure hæl is gehendre þonne we gelyfdon." Þurh ðeonde ingehyd and godne willan, anum gehwilcum is hæl gehendre ðonne him wære ðaða he æt fruman gelyfde, and forði he sceal symle geðeon on dæghwomlicere gecnyrdnysse, swa swa se sealmscop cwæð be Godes gecorenum, "Þa halgan farað fram mihte to mihte." Se apostol beleac þisne pistol mid þisum wordum, "Ac beoð ymbscrydde ðurh Drihten Hælend Crist." Ealle ða ðe on Criste beoð gefullode, hí beoð mid Criste ymbscrydde, gif hi ðone cristendom mid rihtwisnysse weorcum geglengað. 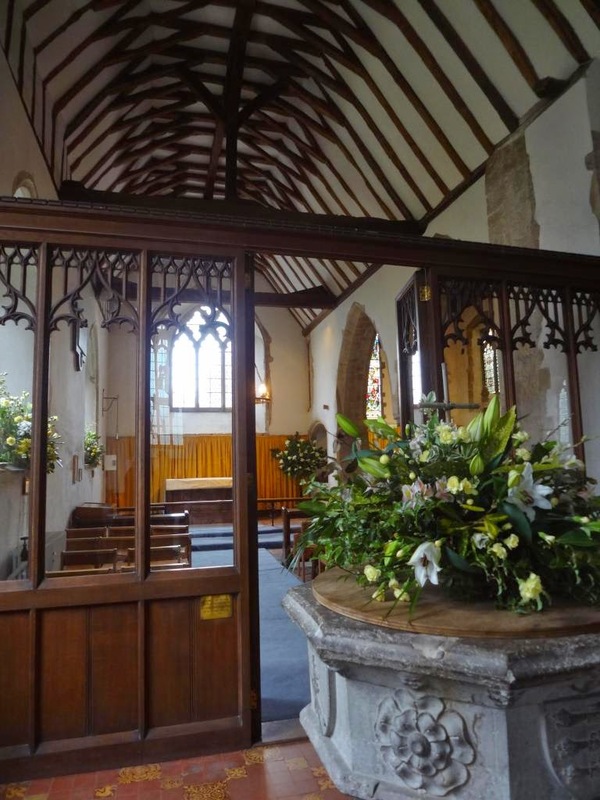 Ðas gewædu awrat se ylca apostol swutellicor on oðre stowe, ðus cweðende, "Ymbscrydað eow, swa swa Godes gecorenan, mid mildheortnysse and mid welwillendnysse, mid eadmodnysse, mid gemetfæstnysse, mid geðylde, and habbað eow, toforan eallum ðingum, ða soðan lufe, seo ðe is bend ealra fulfremednyssa; and Cristes sib blissige on eowrum heortum, on ðære ge sind gecigede on anum lichaman. 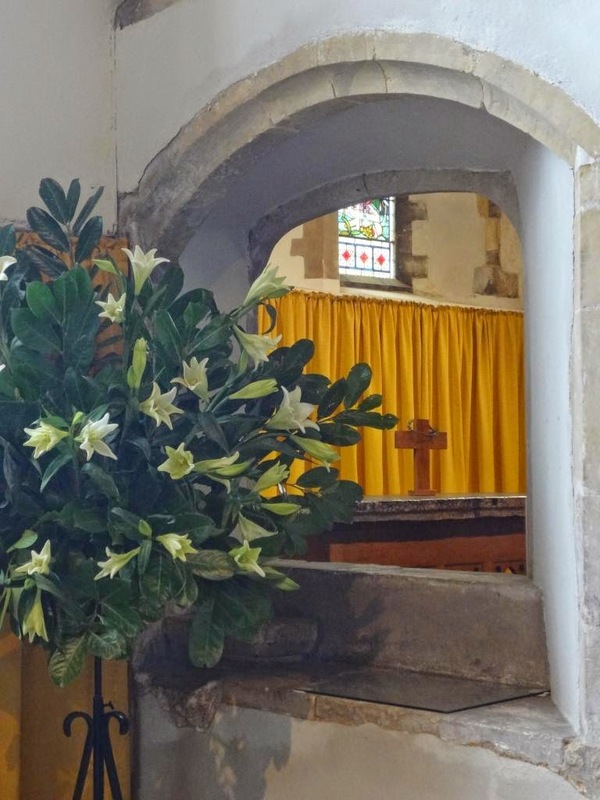 Beoð þancfulle, and Godes word wunige betwux eow genihtsumlice, on eallum wisdome tæcende and tihtende eow betwynan, on sealmsangum and gastlicum lofsangum, singende mid gife Godes on eowrum heortum. Swa hwæt swa ge doð on worde oððe on weorce, doð symle on Drihtnes naman, þancigende ðam Ælmihtigan Fæder ðurh his Bearn, þe mid him symle on annysse þæs Halgan Gastes wunað." Uton forði us gearcian mid þisum foresædum reafum, be ðæs apostoles mynegunge, þæt we to ðære wundorlican gebyrdtide ures Drihtnes mid freolslicere ðenunge becumon, þam sy wuldor and lof a on ecnysse. Amen. Now it is the custom in God's congregation at this season that all the servants of God, in the divine services, both in holy readings and in melodious hymns continually recite the songs of the prophets. The prophets, through the Spirit of God, prophesied the coming of Christ in his incarnation, and wrote many books about it, which we now read in the services of God before the time of his birth, to honour him, because he so lovingly chose to come to us. Christ came to mankind visibly at that time, but he is always invisibly with his beloved servants, just as he himself promised, saying, "Lo, I am with you always, until the fulfilment of this world." With these words he showed that until the ending of the world there would always be people beloved by him, who will become worthy to share God's dwelling with him. The holy prophets prophesied both the first coming in his birth, and also the second at the great judgement. We too, God's servants, strengthen our faith by the services of this season, because in our hymns we confess our redemption by his first coming, and we remind ourselves that we should be ready for his second coming, so that we may follow him from that judgement to the eternal life, as he promised us. The apostle Paul spoke about the celebration of this season in the Epistle to the Roman people and to all believers too, urging thus: "My brothers, you know that it is now time for us to arise from sleep: our salvation is nearer than when we first believed. The night is passed, and the day approaches. Let us cast away the works of darkness, and be clothed with the weapons of light, so that we may walk honourably in the day; not in gluttony and drunkenness, not in fornication and impurity, not in strife and hatred; but be clothed in the Lord, Saviour Christ." The apostle urged us to arise sometime from the sleep of our laziness and faithlessness, as you heard in this present reading. "My brothers, you know that it is now time for us to arise from sleep." Truly it is not fitting for us to be forever soft in our faith, like a tender child; we should hasten on to perfected virtue, by observing God's commands. We should shake off sluggish sleep from ourselves, and leave the works of the devil and walk in the light, that is, in good works. Long ago, the light of knowledge shone throughout the orb of the earth; and very many shine in the way of truth, so that they travel by the path of the gospel to the joy of the eternal life. Even now "our salvation is nearer than when we first believed." Through growing knowledge and good will, salvation is nearer to every person than it was when they first believed, and therefore each should be constantly growing in daily endeavour, just as the psalmist said of God's beloved ones: "The holy go from strength to strength". The apostle closed this epistle with these words, "but be clothed in the Lord, Saviour Christ." All those who are baptised in Christ are clothed with Christ, if they adorn their Christian faith with the works of righteousness. The apostle wrote about these garments more plainly in another place, saying: "Clothe yourselves, as the beloved ones of God, with mercy and with kindness, with humility, with moderation, with patience, and above all things have the true love which is the bond of all perfection; and let the peace of Christ bring you joy in your hearts, in which you were called to be of one body. Be thankful, and let the message of God dwell among you abundantly, in all wisdom instructing and exhorting among yourselves, in psalms and spiritual hymns, singing with the grace of God in your hearts. Whatever you do in words or works, do it always in the name of the Lord, giving thanks to the Almighty Father through his Son, who dwells with him forever in unity with the Holy Spirit." Let us therefore prepare ourselves with these said garments, at the apostle's urging, so that we may come with festive services to the wonderful birth-tide of our Lord, to whom be glory and praise for ever and ever. Amen. We sceolon asceacan ðone sleacan slæp us fram, and deofles weorc forlætan, and gan on leohte, þæt is, on godum weorcum. Gefyrn scean leoht ingehydes geond eorðan ymbhwyrft, and forwel menige scinað on soðfæstnysse wege, þa ðe farað ðurh godspellic siðfæt to ðæs ecan lifes gefean. ('We should shake off sluggish sleep' is just as pleasantly tongue-twistery in Old English: we sceolon asceacan ðone sleacan slæp...) Once, long ago, Ælfric says, the light of knowledge shone geond eorðan ymbhwyrft 'through all the round orb of the earth'; it was a world suffused with light. That all-encompassing light has passed away, but even now amid the dark a few paths (wege) are lit up with brightness, like shafts of sunlight or the trail of a shooting star. 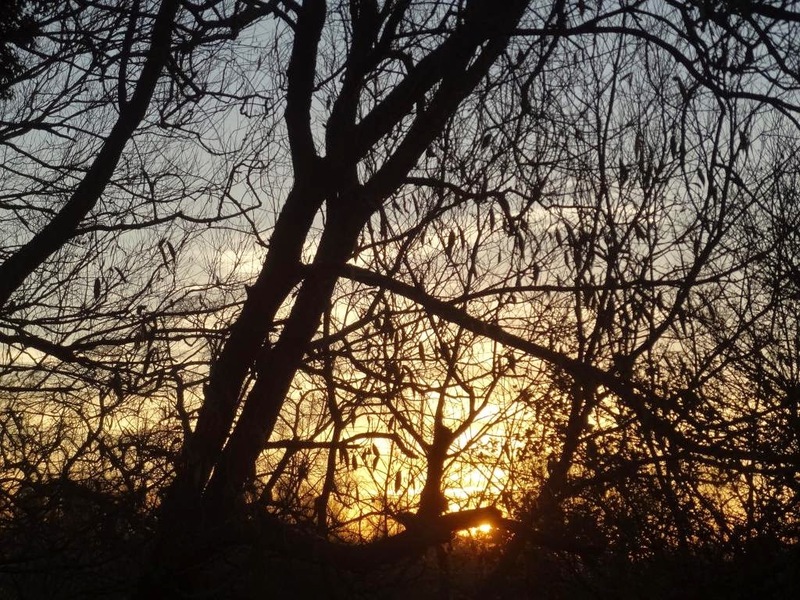 This is a dark, midwinter world, but the efforts of some people can make paths of light through the darkness - people like Ælfric, writing this sermon in a Wessex winter a thousand years ago. Now the leaves grow bare. Of this world's joy, how it all goes to nothing. As if it had never been, truly. All passes but God's will. We all shall die, though it please us ill.
Now it fades all together. And shield us from hell! For I do not know where I shall go, nor how long I shall dwell here. A translation is inadequate, though; a lot of the power of the poem is in the rhymes, and the untranslatable negatives, especially 'Nou hit is, and nou hit nys, / Also hit ner nere, ywys'. There are some clever touches, such as the phrase waxeth bare: 'waxen' can just mean 'to become', but it usually means specifically to 'grow' (like the moon, which waxes and wanes; do we use the word in any other context now?). But when leaves fall, waxing bare, it's the exact opposite of growth; it's death and depletion. Asay now who so will. How shuld me be stable? It may not be thorow skill. Than seke rest in lond. With few be see and sond. Luite and luite leosen hire beute. as day þat scwret and endt in rein. That's the 'consolation of philosophy', isn't it? 23 November is the feast of St Clement, the first-century pope and martyr who was, rather incongruously, a favourite saint with Vikings. (He was martyred by being tied to an anchor and thrown into the sea, therefore he is often shown with an anchor, therefore he is the patron of seafarers, and therefore of Vikings. Impeccable logic!) This is only tangentially related to the subject of today's post, but it is one of my favourite Viking facts. Churches dedicated to St Clement often correlate with areas of Scandinavian settlement and, especially, with Danish military garrisons dating to the reign of Cnut; this probably accounts for the dedication of St Clement Danes in London, St Clement's here in Oxford, and many churches dedicated to St Clement in the former Danelaw. Not long afterwards the king was at Sandwich with his ships. It was [Leofric's] custom that every day he would hear two masses (unless it was more) and all the office too, before he went out. 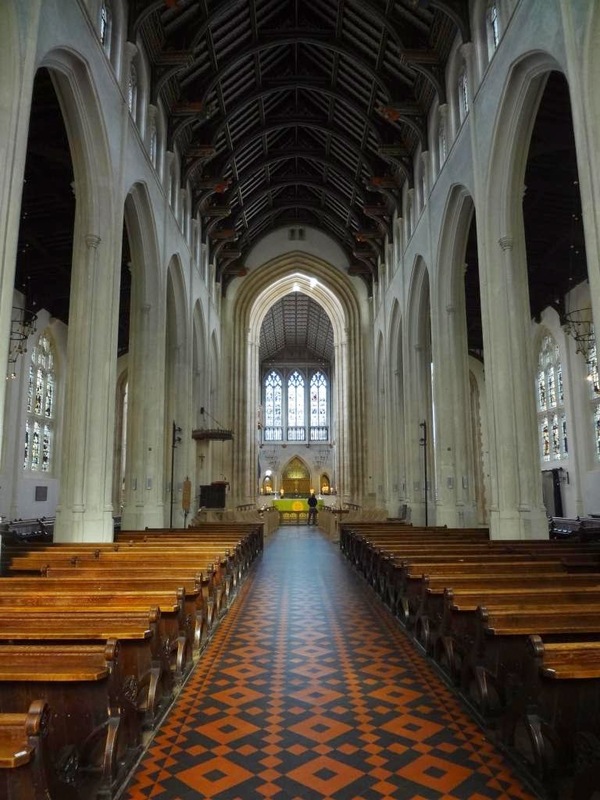 He was going about some necessary business, and Mass was being said before the king in St. Clement’s church. He said to his companions that it would be better if they went to Mass. He went in, and someone called to him at once; he went straightaway inside the sanctuary on the north side, and the king was standing on the south side. There was a triple-threaded wall-hanging there, very thickly woven, which hung behind the altar, and a moderate-sized cross standing on the floor in the north-east corner; there was as much as a good hand's breadth of the cross visible below the hanging, and the rest was between the hanging and the wall. The priest was saying Mass beside the cross. Then [Leofric] saw above the cross a hand, as if it were blessing. At first he thought that it was someone blessing him, because the church was very full of people, but it was not so. Then he looked at it more carefully, and he saw the whole cross as clearly as if there were nothing in front of it, and the blessing hand was moving and going upwards. Then he was afraid, and doubted whether it could really be as it seemed to him. Then as his mind doubted, the hand became visible to him as clearly as he could see his own: its beautiful fingers were slender and long, and the nails distinct, and the large part below the thumb was all visible, and from the little finger to the arm and part of the sleeve. Then he dared not look at it any longer, but hung down his head, and then it ceased from blessing. That was near the time when the Gospel was being read. 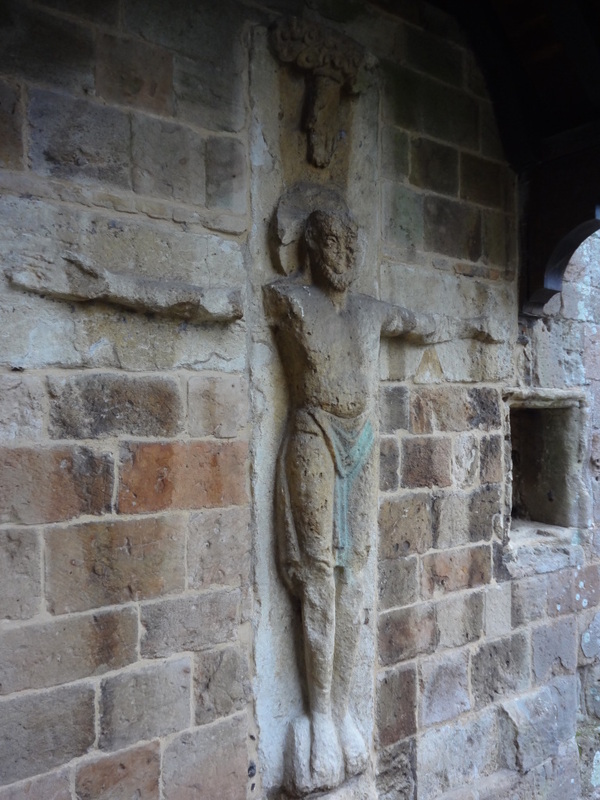 What Leofric sees above the cross seems to be a living embodiment of the 'hand of God' motif which is often a part of Anglo-Saxon crucifix scenes - as, for instance, in the Romsey crucifix, made about twenty years before Leofric had his vision. 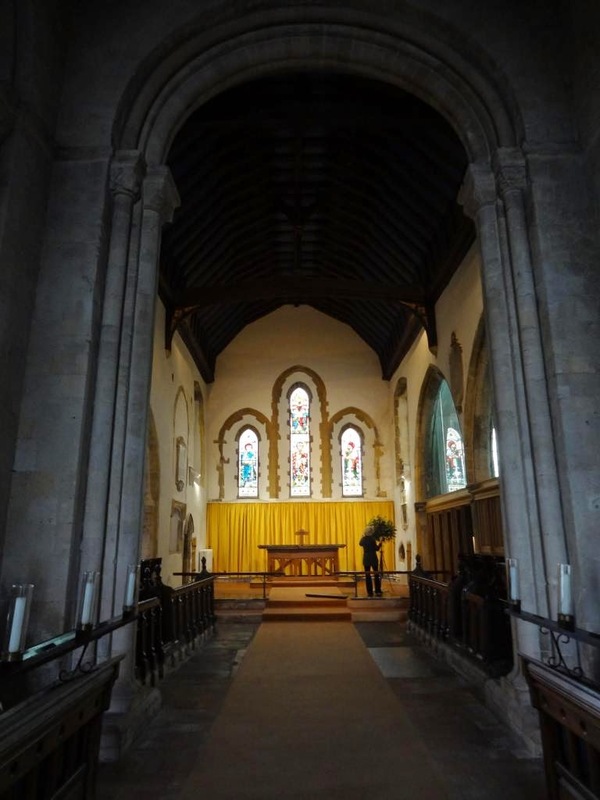 Leofric's vision in Sandwich was later connected with the hagiography of Edward the Confessor and taken to be related to the saintliness of the king, but there's no sign of that here (the king isn't even named); this is all about Leofric. 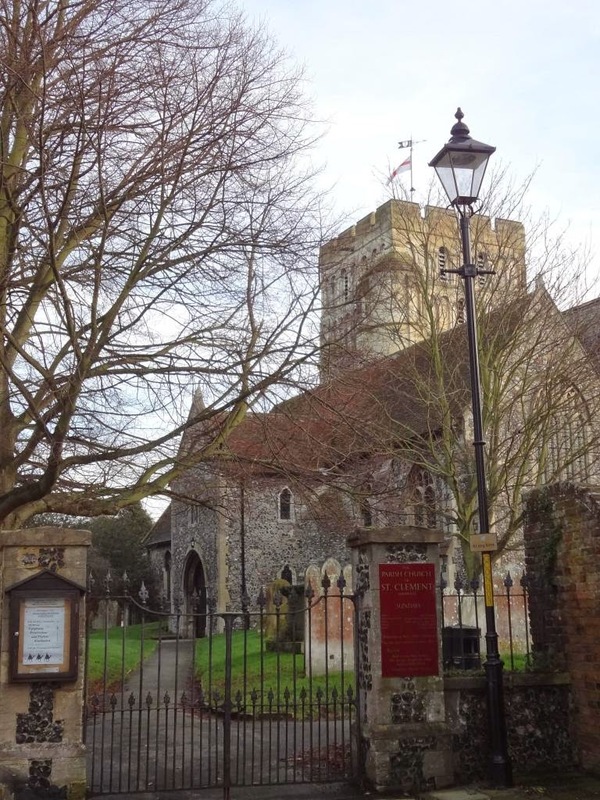 Sandwich, on the easternmost point of the Kent coast, was an important port in the medieval period, and the Anglo-Saxon Chronicle records that King Edward was regularly there with his fleet in the troubled years of the 1040s and 1050s - so this is probably when Leofric's vision took place in St Clement's. 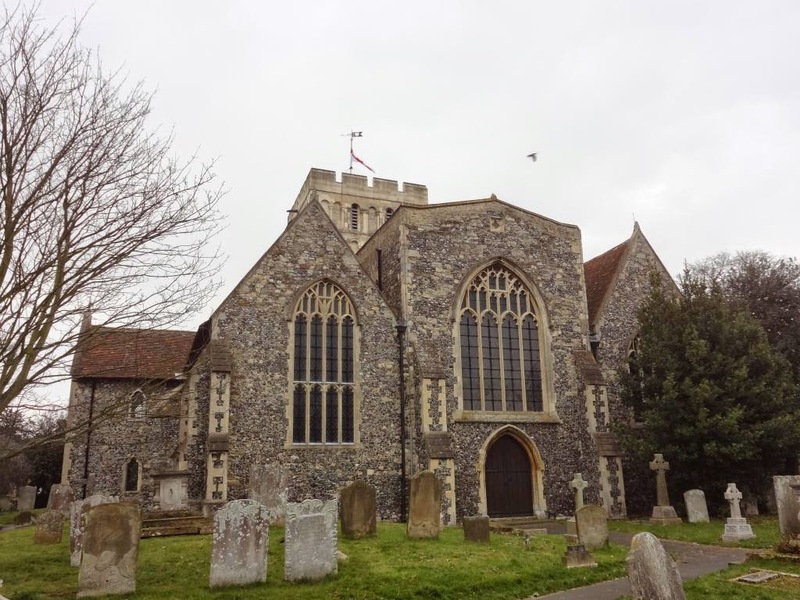 Of Sandwich's several medieval churches, this is the one closest to the harbour, an appropriate place for a church dedicated to the seafarers' saint. Just look at that thing! It's more like a castle keep than a church bell-tower. 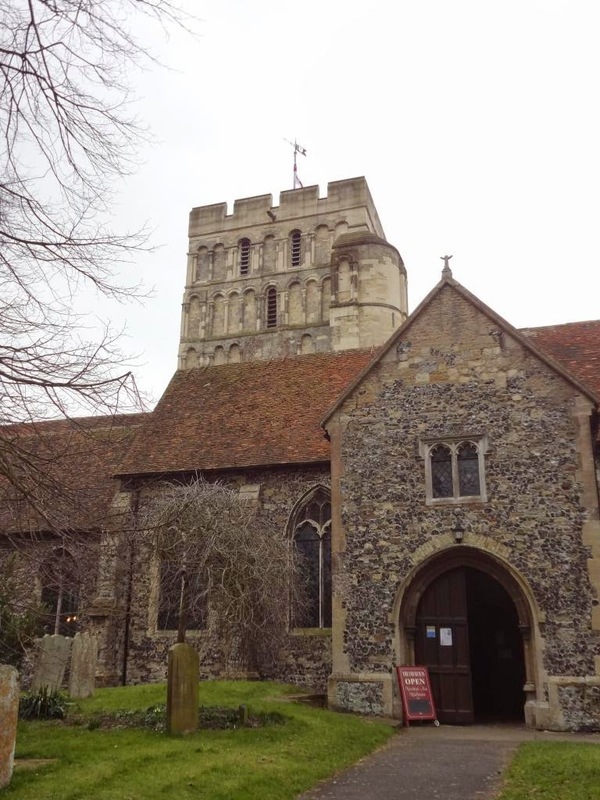 It's a big church for a little bit of the town (especially since, as I said, there are several medieval churches in Sandwich), but once they'd built that massive tower I suppose they couldn't keep things on a small scale. 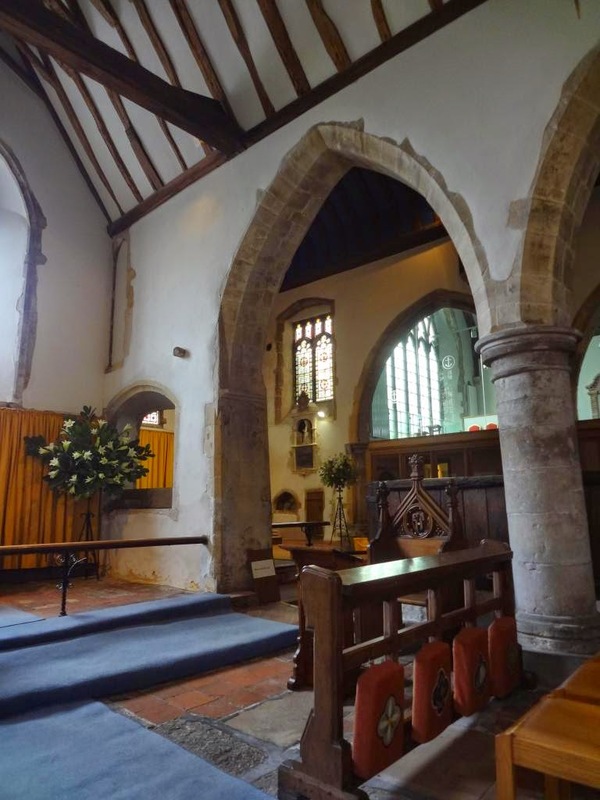 Also the nave was rebuilt and extended in the fifteenth century, after it was destroyed when the French attacked the town. Because that's the kind of thing that happens in Sandwich. 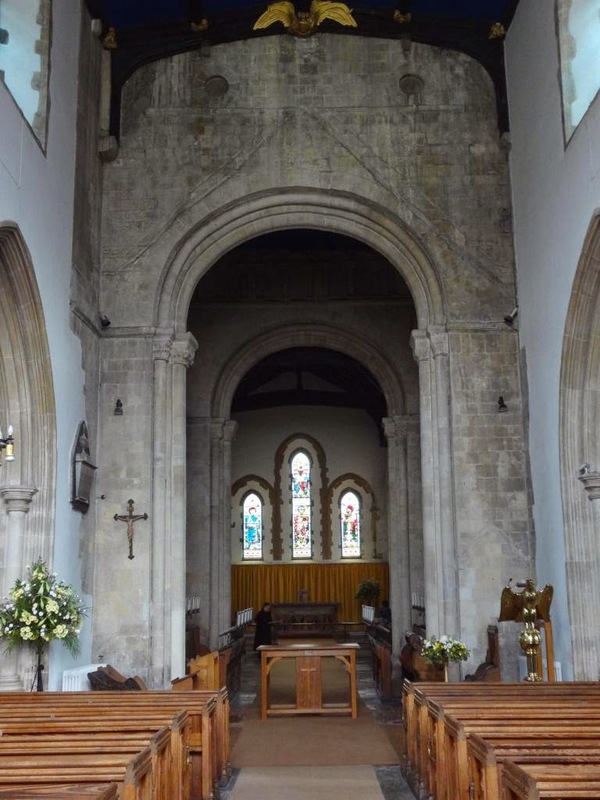 It's a strange feeling to stand within the huge tower and look up; it's really not like being in a church at all. 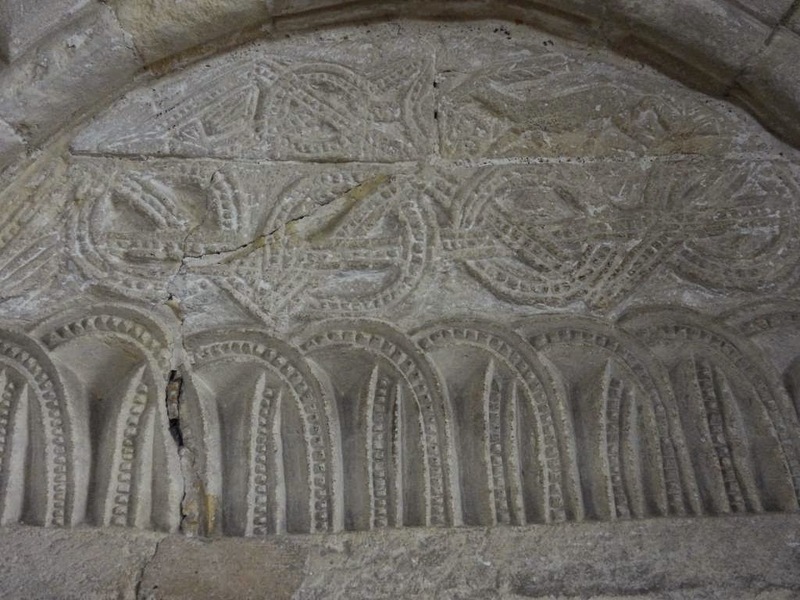 This is Norman carving of the loveliest kind - dated to the mid-twelfth century, I believe. 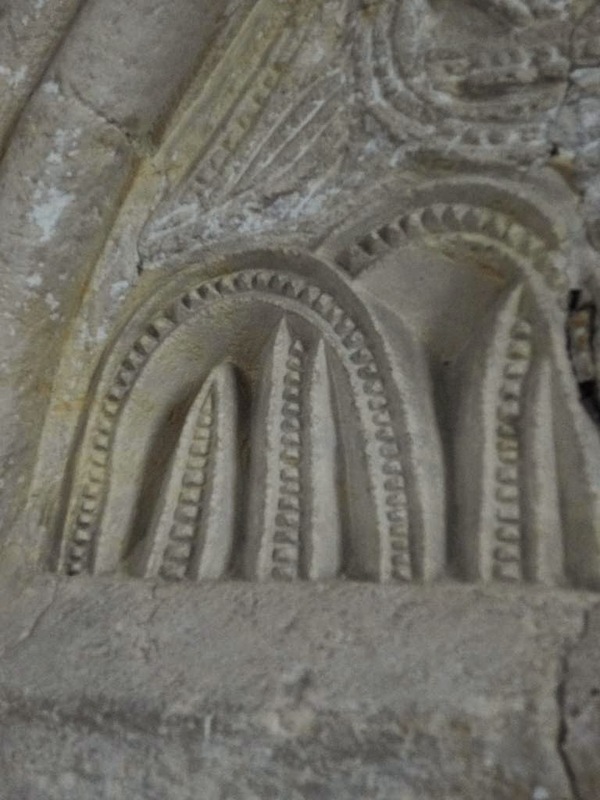 This is recognisably akin to the decoration on the Norman font now in St Martin's, Canterbury, which originally came from the cathedral. Isn't that wonderful? 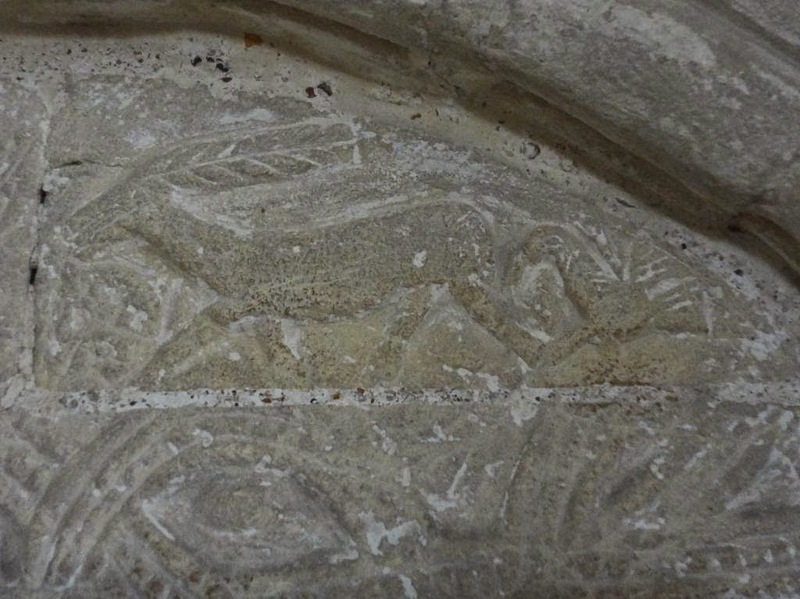 It's a deer and a duck, I think - maybe a hunting scene of some kind. So lovely, and so tiny, and just hidden away around a corner. 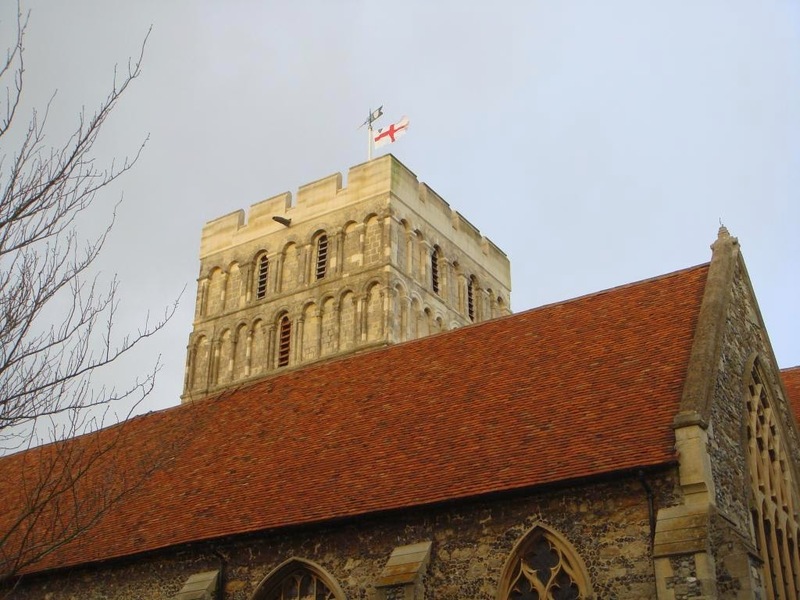 I, Cnut, by the grace of God king of England and of all the adjacent islands, lay the royal crown from my head with my own hands upon the altar of Christ in Canterbury for the benefit of the said monastery, and I grant to the said monastery for the sustenance of the monks the harbour at Sandwich with all the landings and dues on either side of the river from Pepperness to Marfleet, extending as far as a small axe can be thrown from a ship onto the land, when the ship is afloat and the river is in full flood. And if there is anything in the great sea beyond the harbour, their rights shall extend as far as the sea at the utmost recedes, and [as far as] the length of a man holding a pole in his hand, and stretching himself as far as he can reach into the sea." I wonder what St Clement, the sailors' saint, would think of this kind of watery dominion. 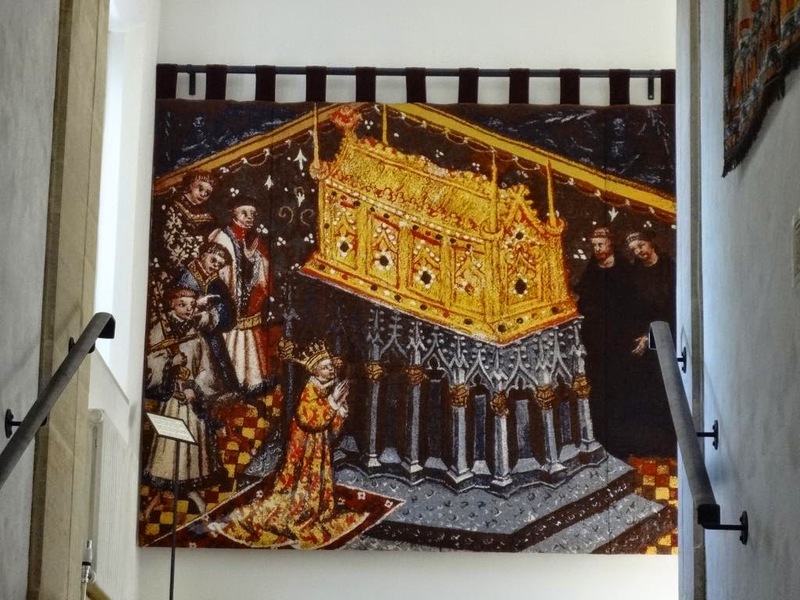 The eastern end of the church has been rebuilt, and we can only imagine the cross and the triple-threaded wall-hanging of Leofric's vision - but it's not hard to imagine them. 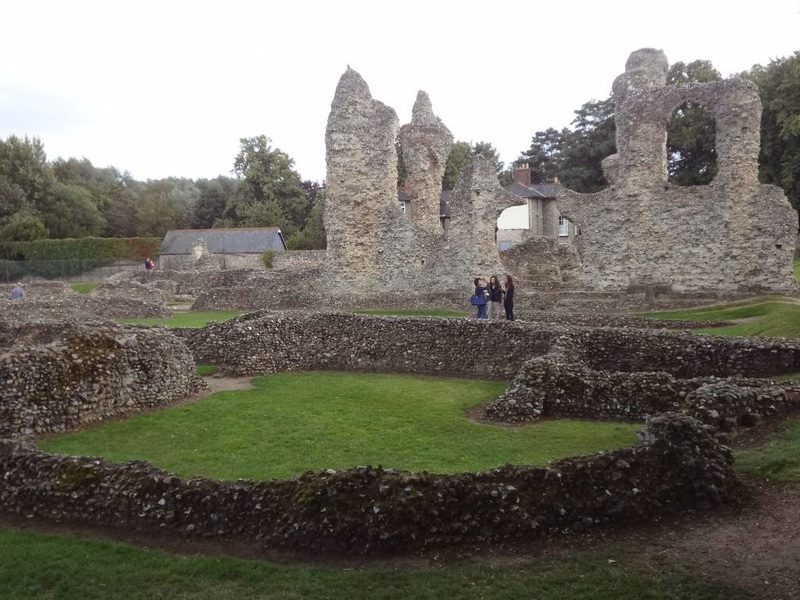 The Saxon church may have looked different, but it was on this spot that Leofric saw whatever it was he saw. Peter A. Stokes, 'The Vision of Leofric: Manuscript, Text and Context', Review of English Studies 63 (2012), 529-550. A. S. Napier, 'An Old English Vision of Leofric, Earl of Mercia', Transactions of the Philological Society 26:2 (1908), 180-188. Milton McC. 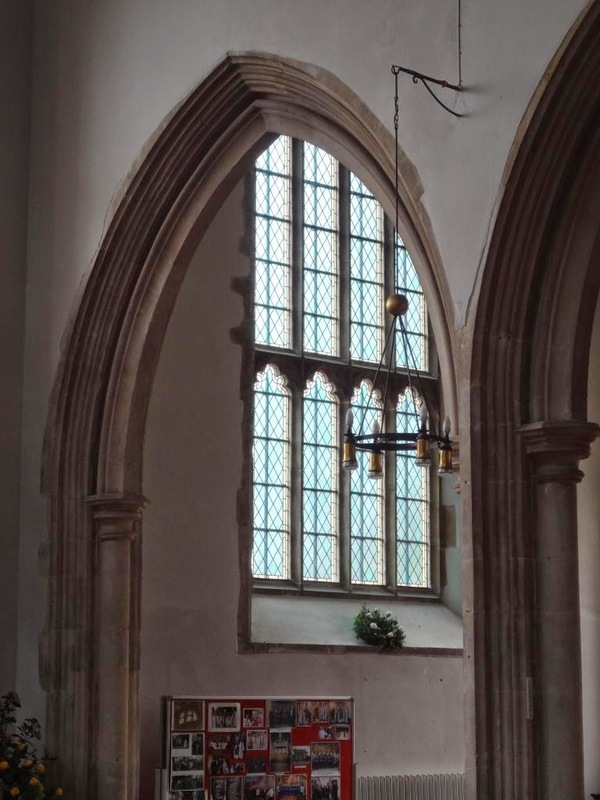 Gatch, 'Miracles in architectural settings: Christ Church, Canterbury and St Clement's, Sandwich in the Old English Vision of Leofric', Anglo-Saxon England 22 (1993), 227-252. 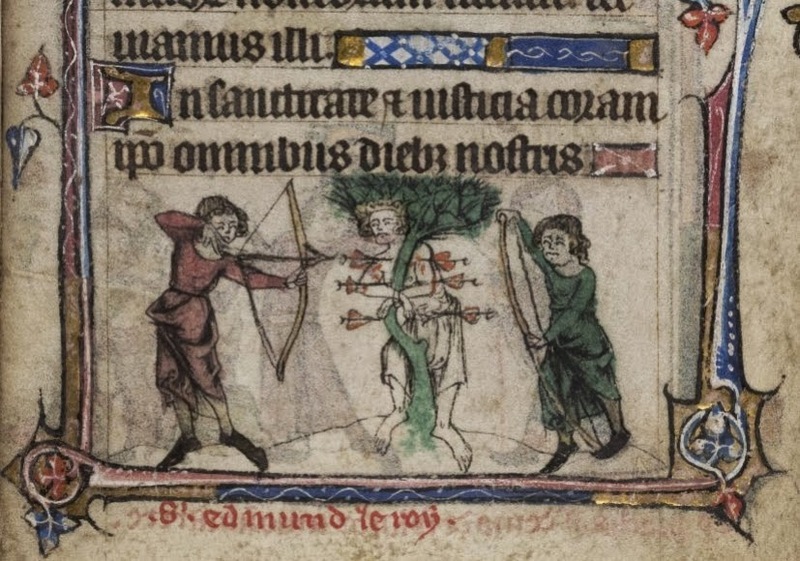 Today is the feast of St Edmund, King of East Anglia, who was killed by an invading Viking army in 869. 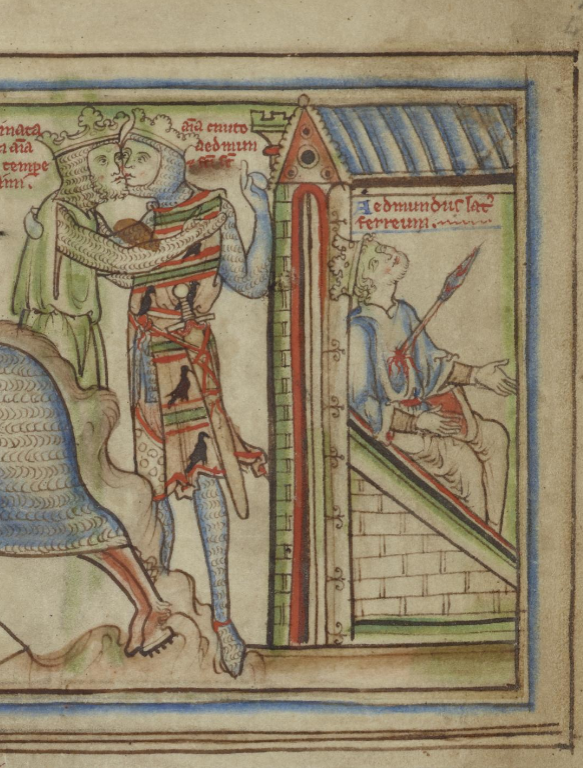 I've posted about St Edmund quite a bit over the years I've been writing this blog, not only because the Vikings in England are my particular interest, but because Edmund is today one of the most popular of Anglo-Saxon saints, especially beloved in his former kingdom. 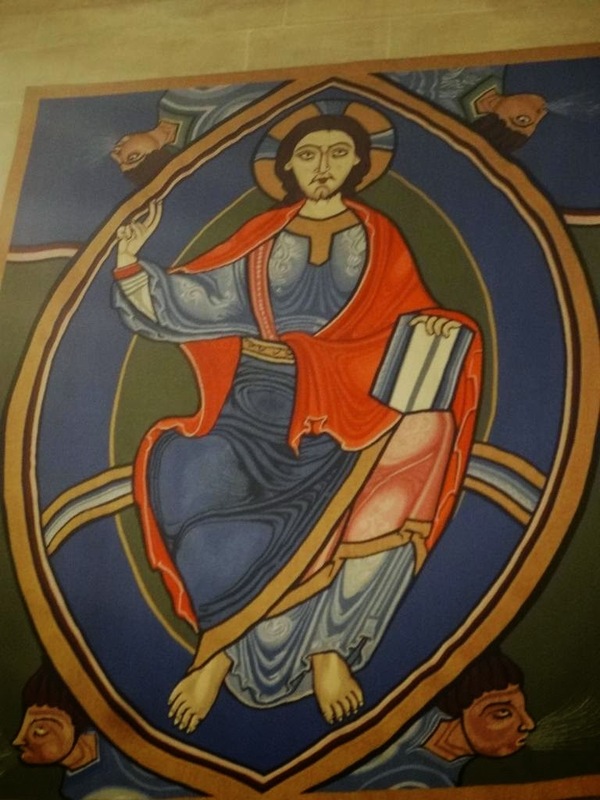 (And therefore much depicted in modern church art). 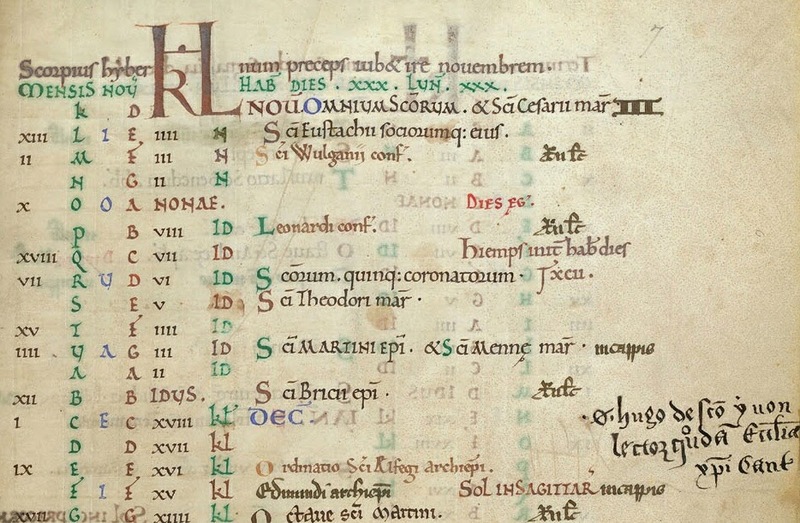 I wrote about the later medieval developments in Edmund's legend here, but today I want to post some of the Old English Life of Edmund written at the end of the tenth century by the homilist Ælfric. I've posted an extract from this text at least once before, but I'll do so again because - well, why not. This was one of the first pieces of Old English I ever learned, as a first-year undergraduate, so it has a special place in my heart. 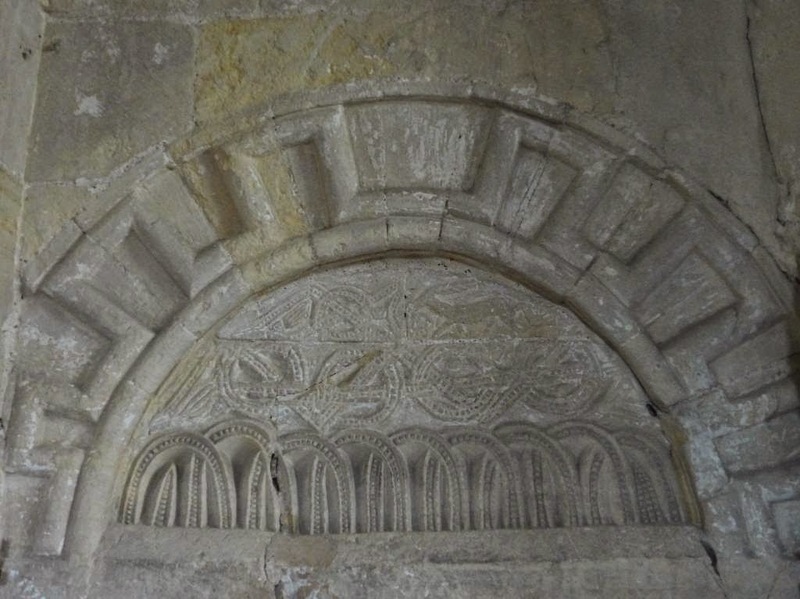 Sum swyðe gelæred munuc com suþan ofer sæ fram sancte Benedictes stowe on Æþelredes cynincges dæge to Dunstane ærcebisceope, þrim gearum ær he forðferde, and se munuc hatte Abbo. Þa wurdon hi æt spræce oþþæt Dunstan rehte be sancte Eadmunde, swa swa Eadmundes swurdbora hit rehte Æþelstane cynincge þa þa Dunstan iung man wæs, and se swurdbora wæs forealdod man. Þa gesette se munuc ealle þa gereccednysse on anre bec, and eft ða þa seo boc com to us binnan feawum gearum þa awende we hit on englisc, swa swa hit heræfter stent. This is an impeccable chain of authorities: learned Abbo, saintly Dunstan, the glorious King Æthelstan, and an eyewitness. 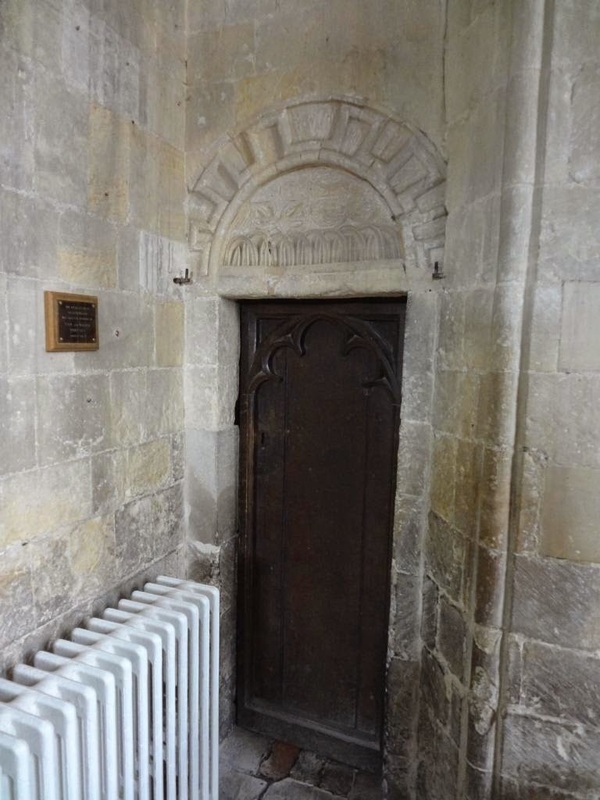 The chain covers about 130 years between Edmund's death and Ælfric translating the Life: Edmund was killed in 869, Æthelstan ruled between 924-39, and Dunstan died in 988. 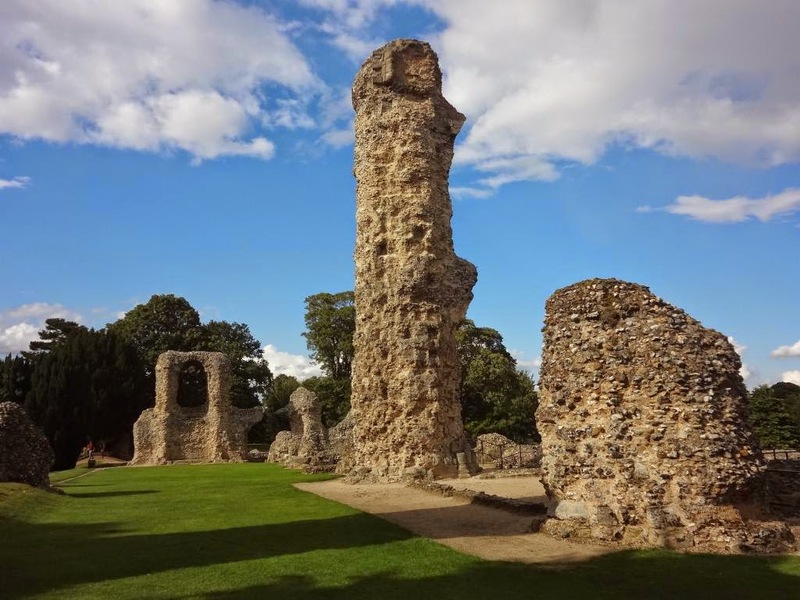 The East Anglian royal line was wiped out by Edmund's death, and by the time of Æthelstan the kings of Wessex, now kings of all England, had in a sense adopted the martyred East Anglian king as one of their forebears. 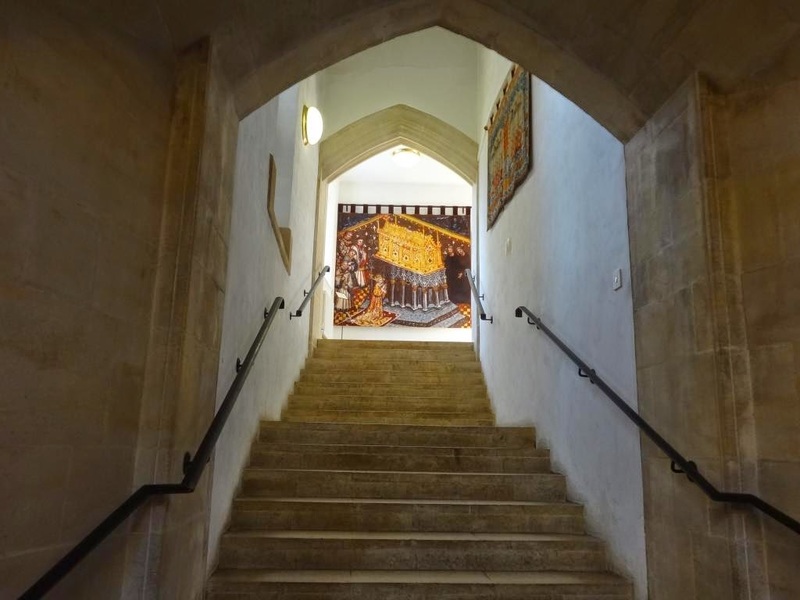 So we can imagine the old sword-bearer telling his story at Æthelstan's court, and young Dunstan listening ('with tears in his eyes', Abbo says) in between all his music, metalwork, manuscript-correcting, and devil-fighting. 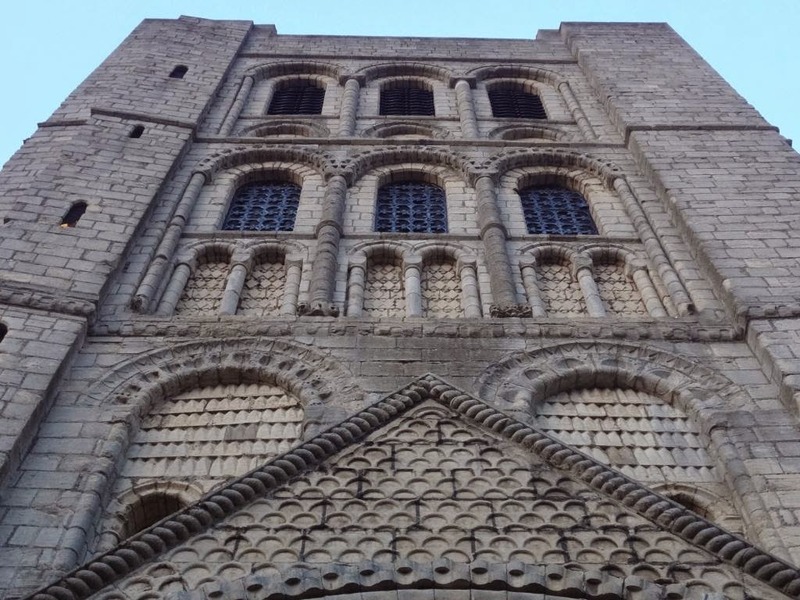 (This was presumably before Dunstan was driven out of Æthelstan's court by accusations of black magic...) If there weren't already enough reasons to admire multi-talented Dunstan, his role in preserving Edmund's story gives him a claim to the gratitude of all fans of Anglo-Saxon saints. Ælfric produced his Lives of Saints in the late 990s. Between Dunstan telling the story to Abbo in 985, and Ælfric translating Abbo's Passio some ten years later, Edmund's death had suddenly become all too topical. The Vikings were back, more organised and effective than ever. In the last years of Dunstan's life, the Anglo-Saxon Chronicle records Viking raids along the south coast of England for the first time in decades, and it was later believed that Dunstan in his last days knew this was the beginning of worse to come - that he prophetically foresaw all the disasters which would befall England through the course of the eleventh century. 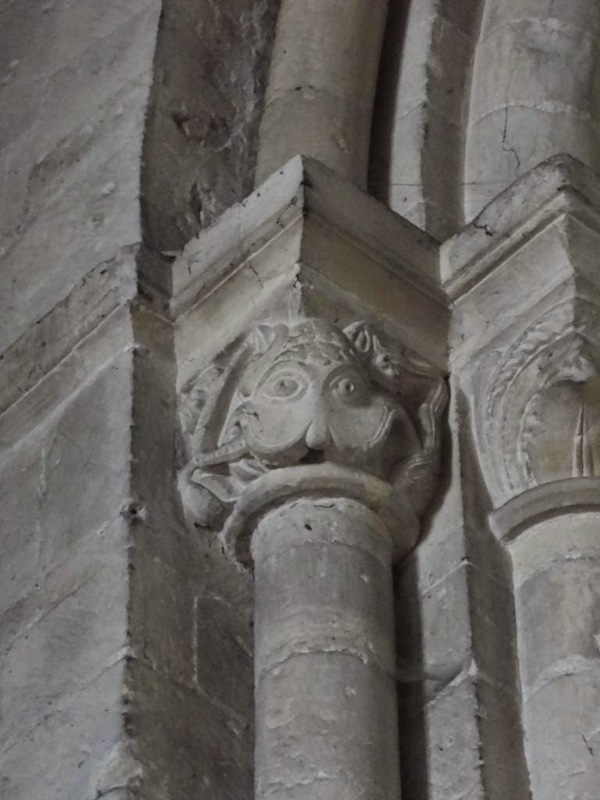 If Dunstan was telling stories from his youth about St Edmund in 985, this might be why. And by the late 990s things had only grown worse: one might argue (I would, in fact) that at the same time as Ælfric was writing his Life of Edmund a poet somewhere in Edmund's old kingdom was busy writing The Battle of Maldon, a poem which similarly tells of an East Anglian nobleman slain by a Viking army, and which in a different way finds heroism in a catastrophic defeat. The whole Life can be found online in Old English and in Modern English, but here are some extracts. (I've added punctuation, and the translation is mine. Abbo's original can be found here.) It's particularly worth seeing the Old English alongside the translation because this text is written in Ælfric's distinctive style of alliterative, rhythmical prose, which can produce some beautiful effects - as exemplified by a line like 'Eadmund se eadiga, Eastengla cynincg', the first line of the Life proper. Here the alliteration also plays on the first element of the saint's name (ead, blessed). Eadmund se eadiga, Eastengla cynincg, wæs snotor and wurðfull and wurðode symble mid æþelum þeawum þone ælmihtigan god. He wæs eadmod and geþungen and swa anræde þurhwunode þæt he nolde abugan to bysmorfullum leahtrum ne on naþre healfe he ne ahylde his þeawas ac wæs symble gemyndig þære soþan lare: 'þu eart to heafodmen geset? ne ahefe þu ðe, ac beo betwux mannum swa swa an man of him.' He wæs cystig wædlum and wydewum swa swa fæder and mid welwillendnysse gewissode his folc symble to rihtwisnysse and þam reþum styrde and gesæliglice leofode on soþan geleafan. Hit gelamp ða æt nextan þæt þa deniscan leode ferdon mid sciphere hergiende and sleande wide geond land, swa swa heora gewuna is. On þam flotan wæron þa fyrmestan heafodmen Hinguar and Hubba, geanlæhte þurh deofol, and hi on norðhymbralande gelendon mid æscum and aweston þæt land þa leoda ofslogon. Þa gewende Hinguar east mid his scipum and Hubba belaf on norðhymbralande gewunnenum sige mid wælhreownysse. Hinguar þa becom to east englum rowende on þam geare þe ælfred æðelincg an and twentig geare wæs, se þe west-sexena cynincg siþþan wearð mære. And se foresæda Hinguar færlice swa swa wulf on lande bestalcode and þa leode sloh weras and wif and þa ungewittigan cild, and to bysmore tucode þa bilewitan cristenan. He sende ða sona syððan to þam cyninge beotlic ærende þæt he abugan sceolde to his manrædene gif he rohte his feores. Se ærendraca com þa to Eadmunde cynincge and Hinguares ærende him ardlice abead. "Hinguar ure cyning, cene and sigefæst on sæ and on lande, hæfð fela þeoda gewyld and com nu mid fyrde færlice her to lande þæt he her wintersetl mid his werode hæbbe. Nu het he þe dælan þine digelan goldhordas and þinra yldrena gestreon ardlice wið hine and þu beo his underkyning, gif ðu cucu beon wylt, for ðan þe ðu næfst þa mihte þæt þu mage him wiðstandan. 'It happened in the end that the Danish people came with a ship-army, harrying and killing throughout the country, as is their habit. [!] The foremost leaders of the fleet were Inguar and Ubbe [i.e. Ivar the Boneless and his brother, sons of the legendary Danish king Ragnar Lothbrok], united through the devil, and they landed in Northumbria with their ships and laid waste the land and slew the people. Then Inguar turned east with his ships, and Ubbe remained in Northumbria, having won the victory with cruelty. Then Inguar came rowing to East Anglia in the year that Alfred the prince was twenty-one years old, who was later to be the glorious king of the West Saxons [that's Alfred the Great, of course]. And this Inguar suddenly stalked the land like a wolf, and slew the people, men and women and innocent children, and too shamefully harassed blameless Christians. Before answering the messenger, Edmund consults with a bishop, who advises him to submit. 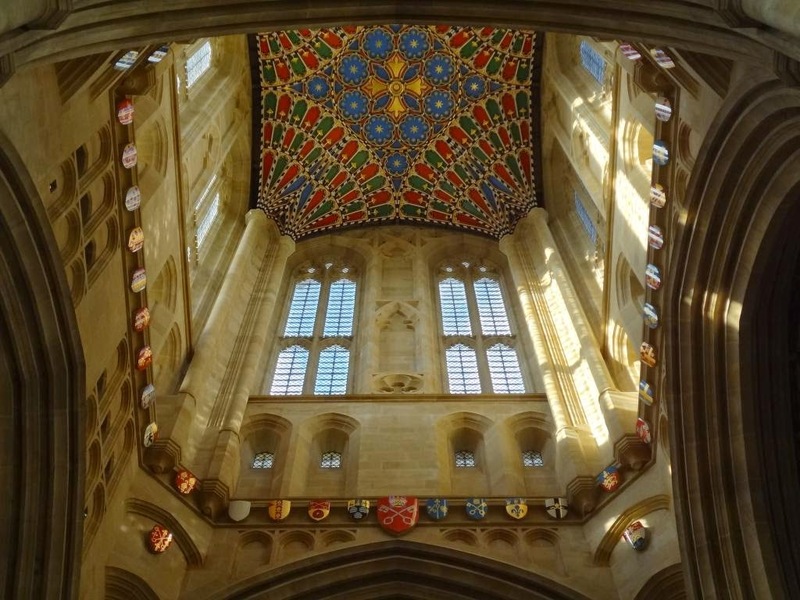 Edmund says he would rather fight and die in battle than do that, but the bishop reminds him that he does not have the forces to fight, because so many of his people have been killed. His only options are to submit or to die. Þa cwæð Eadmund cyning, swa swa he ful cene wæs, "þæs ic gewilnige and gewisce mid mode, þæt ic ana ne belife æfter minum leofum þegnum þe on heora bedde wurdon, mid bearnum and wifum, færlice ofslægene fram þysum flotmannum. Næs me næfre gewunelic þæt ic worhte fleames, ac ic wolde swiðor sweltan gif ic þorfte for minum agenum earde, and se ælmihtiga God wat þæt ic nelle abugan fram his biggengum æfre, ne fram his soþan lufe, swelte ic, lybbe ic." He sends a message back to Inguar saying that he will not submit unless the Danish king converts to Christianity. 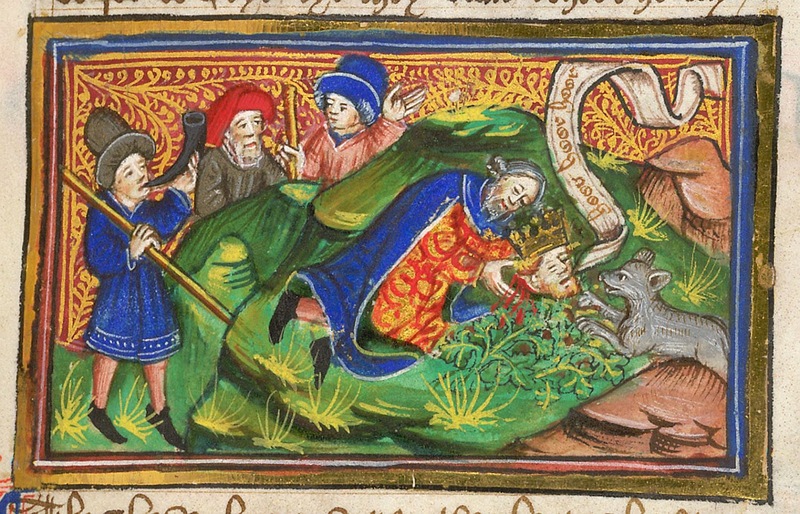 Inguar orders Edmund to be captured, bound and killed. The Danes descend on Edmund as he stands within his hall, and he does not resist them. Hwæt þe arleasan þa Eadmund gebundon and gebysmrodon huxlice and beoton mid saglum, and swa syððan læddon þone geleaffullan cyning to anum eorðfæstum treowe and tigdon hine þærto mid heardum bendum, and hine eft swuncgon langlice mid swipum, and he symble clypode betwux þam swinglum mid soðan geleafan to hælende Criste, and þa hæþenan þa for his geleafan wurdon wodlice yrre for þan þe he clypode Crist him to fultume. Hi scuton þa mid gafelucum swilce him to gamenes to oð þæt he eall wæs besæt mid heora scotungum swilce igles byrsta, swa swa Sebastianus wæs. Þa geseah Hingwar se arlease flotman þæt se æþela cyning nolde Criste wiðsacan, ac mid anrædum geleafan hine æfre clypode, het hine þa beheafdian, and þa hæðenan swa dydon. Betwux þam þe he clypode to Criste þagit þa tugon þa hæþenan þone halgan to slæge and mid anum swencge slogon him of þæt heafod, and his sawl siþode gesælig to Criste. Þær wæs sum man gehende, gehealdan þurh God behyd þam hæþenum, þe þis gehyrde eall and hit eft sæde swa swa we hit secgað her. Hwæt ða se flothere ferde eft to scipe and behyddon þæt heafod þæs halgan Eadmundes on þam þiccum bremelum þæt hit bebyrged ne wurde. 'Then the wicked ones bound Edmund and shamefully mocked him, and beat him with clubs, and afterwards led the faithful king to a tree fixed in the earth and tied him to it with hard bonds. 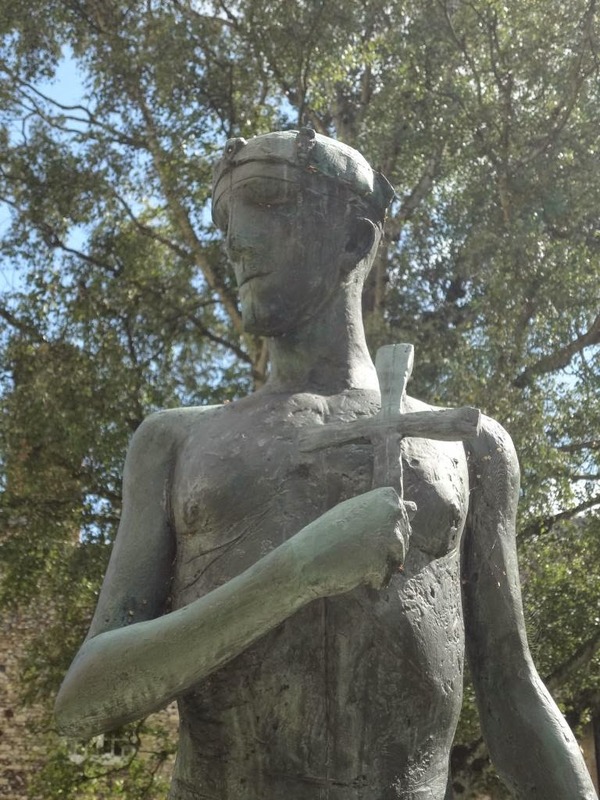 They scourged him for a long time with whips, and he constantly cried out between the strokes with true faith to the Saviour Christ, and the heathen were madly enraged by his faith because he cried to Christ to help him. They shot at him with missiles as if for their amusement, until he was entirely covered with their shots like the spines of a hedgehog, just as Sebastian was. When Inguar, the wicked seaman, saw that the noble king would not forsake Christ, but with steadfast faith constantly called upon him, he ordered him to be beheaded, and the heathens did this. While he was still calling upon Christ, the heathens dragged the holy one away to slay him, and with one stroke cut off his head; and his soul travelled in blessedness to Christ. Wæs eac micel wundor, þæt an wulf wearð asend þurh Godes wissunge to bewerigenne þæt heafod wið þa oþre deor ofer dæg and niht. Hi eodon þa secende and symle clypigende swa swa hit gewunelice is þam ðe on wuda gað oft, "Hwær eart þu nu, gefera?" and him andwyrde þæt heafod, "Her, her, her!" and swa gelome clypode andswarigende him eallum swa oft swa heora ænig clypode oþþæt hi ealle becomen þurh ða clypunga him to. Þa læg se græga wulf þe bewiste þæt heafod. And mid his twam fotum hæfde þæt heafod beclypped grædig and hungrig and for Gode ne dorste þæs heafdes abyrian, and heold hit wið deor. Þa wurdon hi ofwundrode þæs wulfes hyrdrædenne and þæt halige heafod ham feredon mid him, þancigende þam ælmihtigan ealra his wundra, ac se wulf folgode forð mid þam heafde oþþæt hí to tune comon swylce he tam wære and gewende eft siþþan to wuda ongean. Þa landleoda þa siþþan ledon þæt heafod to þam halgan bodige and bebyrigdon hine swa swa hí selost mihton on swylcere hrædinge and cyrcan arærdan sona him onuppon. þa wæs micel wundor þæt he wæs eall swa gehal swylce he cucu wære mid clænum lichaman and his swura wæs gehalod þe ær wæs forslagen and wæs swylce an seolcen þræd embe his swuran ræd, mannum to sweotelunge hu he ofslagen wæs. Eac swilce þe wunda þe þa wælhreowan hæþenan mid gelomum scotungum on his lice macodon wæron gehælede þurh þone heofonlican God and he liþ swa ansund oþ þisne andwerdan dæg, andbidigende æristes and þæs ecan wuldres. Ælfric then recounts some miracles which took place after Edmund's death, and concludes by saying "Nis Angelcynn bedæled drihtnes halgena" - 'the English are not deprived of the saints of God' - and he lists a few other examples as well as Edmund. This is, of course, characteristic Anglo-Saxon understatement - what he means is that the English have plenty of saints of their own. 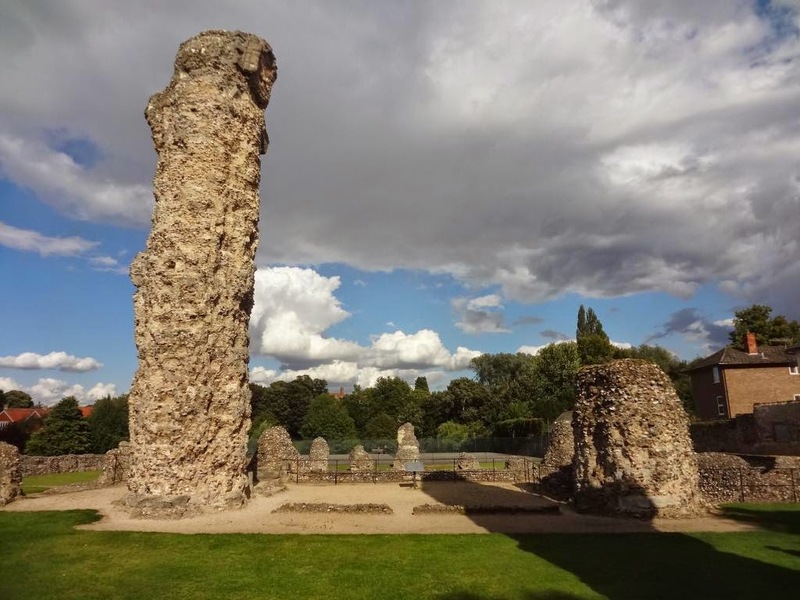 These are the ruins of the abbey church at Bury St Edmunds, which was founded in the eleventh century, some thirty-five years after the writing of Ælfric's Life. 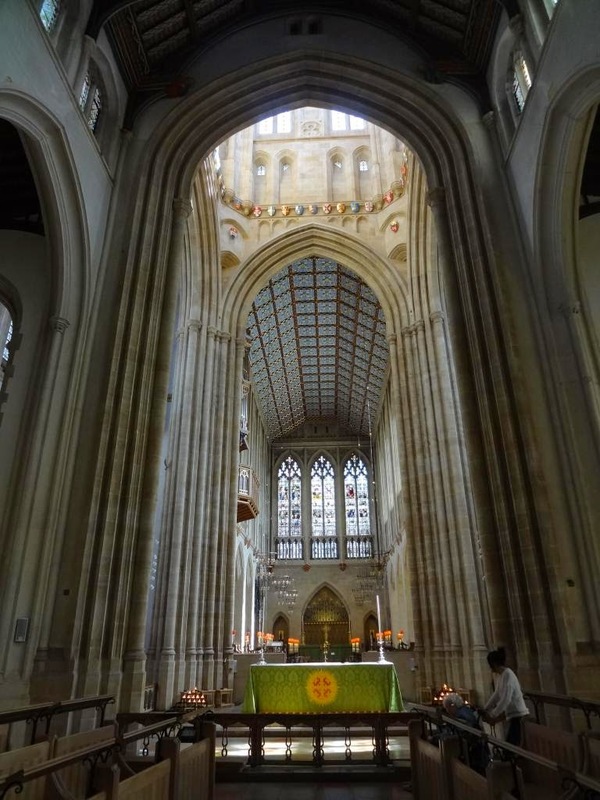 According to Bury St Edmunds tradition the abbey was founded by Cnut; after he became king of England Cnut was an enthusiastic patron of St Edmund's cult - one way for a Danish king of England to reconcile his dual roles as successor to the kings of Wessex and heir to the conquests of the Danish kings (including Ivar the Boneless). 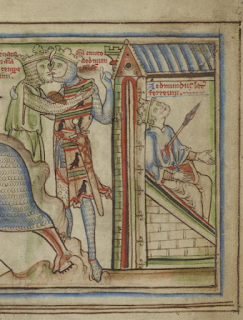 Later legend said that St Edmund was responsible for the death of Cnut's father Svein Forkbeard in 1013, getting some revenge on the Danes from beyond the grave. 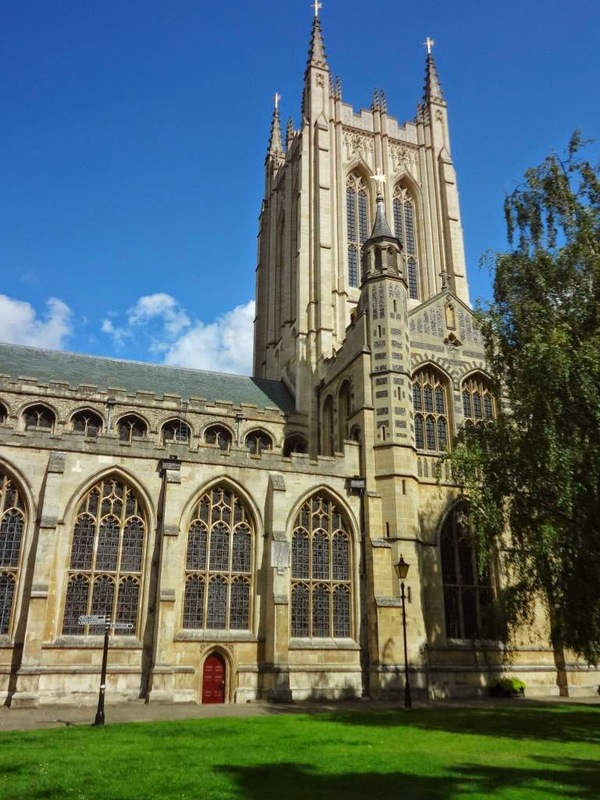 Bury St Edmunds soon became one of the leading religious houses in England, a prominence it retained throughout the medieval period, and the church which now lies in ruins was once in size and splendour the equal of any cathedral in the country. 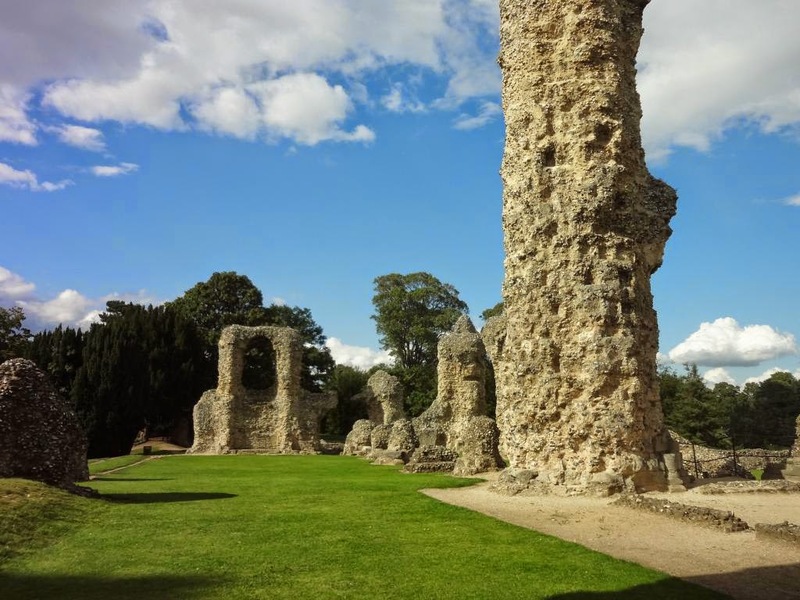 So in case the death of St Edmund was making you think ill of the Vikings today, it's salutary to remember it was a Viking king who helped to build this monastery, which for hundreds of years fostered physicians, poets, artists, chroniclers, administrators, and key moments in constitutional history, as well as many hidden lives of pilgrimage and prayer. 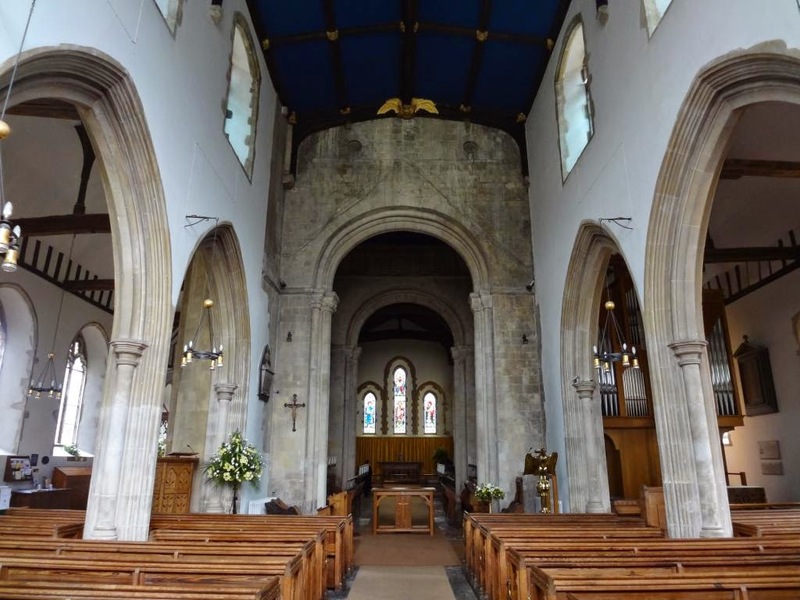 Next time you feel like using 'medieval' as a pejorative, consider that a Viking king founded this place - and in 1539 a Tudor king tore it down. But this would once have been dwarfed by the towers around it. 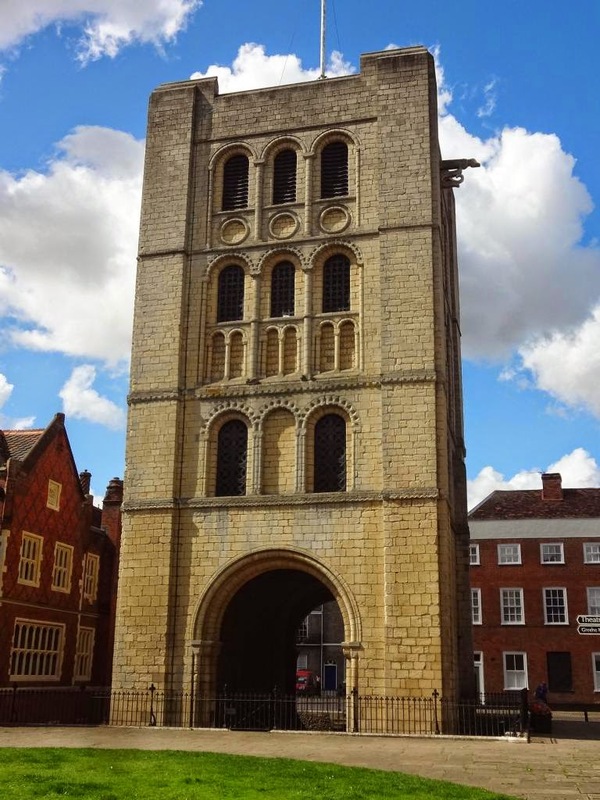 When I was there the tower contained the friendliest group of bell-ringers you could ever hope to meet; I think they must have been the guardian spirits of the place, they were so overwhelmingly welcoming. This tower was built in 2005! These are based on images from the fifteenth-century BL Harley 2278 and the twelfth-century 'Bury Bible', respectively. 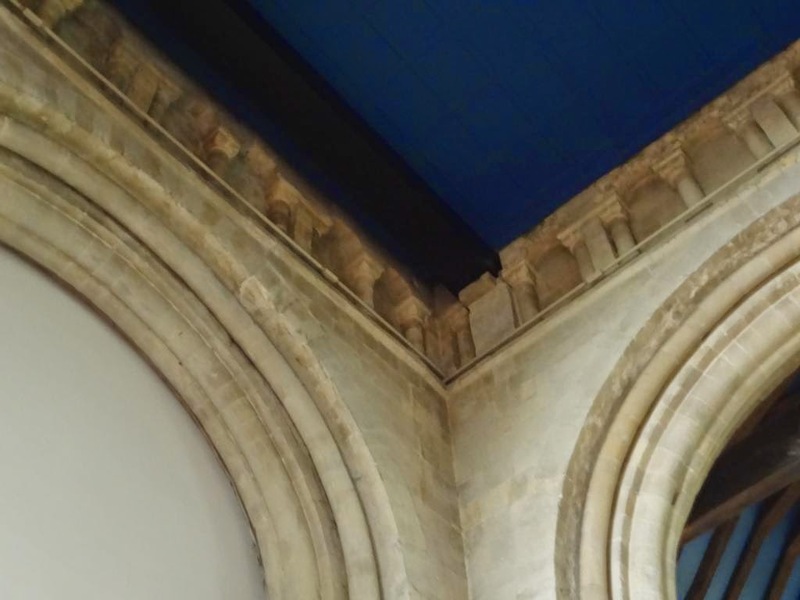 More former monastic churches should do things like this - when manuscripts have been swallowed up into institutional libraries, it's all too easy to forget where they originally came from. 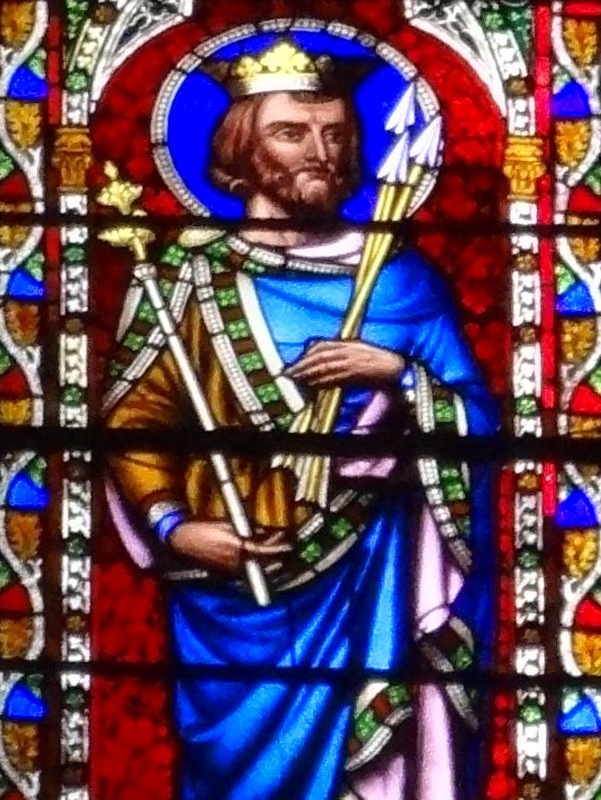 The cathedral also houses this new statue of Edmund, which has become my favourite modern depiction of the saint. It shows him as a young king, proud and defiant in his bonds. 16 November is a feast shared by two medieval English saints: St Margaret of Scotland, one of my favourites, and Oxford's own St Edmund Rich. 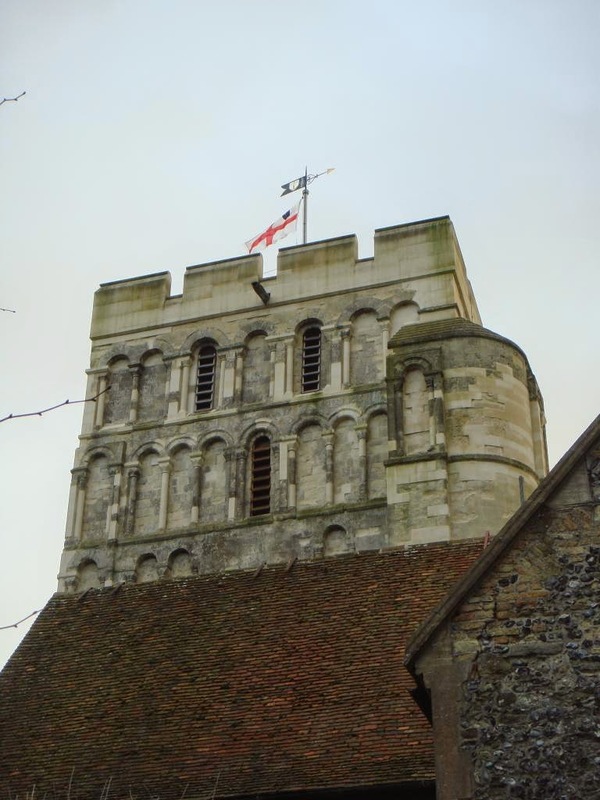 But before it was their feasts - in fact, before either of those people was born - today was kept in eleventh-century Canterbury as the feast of the ordination of St Alphege. By the middle of the eleventh century the recently-martyred archbishop Alphege already had two perfectly good feasts, in April and in June (his death and translation, respectively), but when you have such a martyr to commemorate you can hardly go overboard, I suppose. 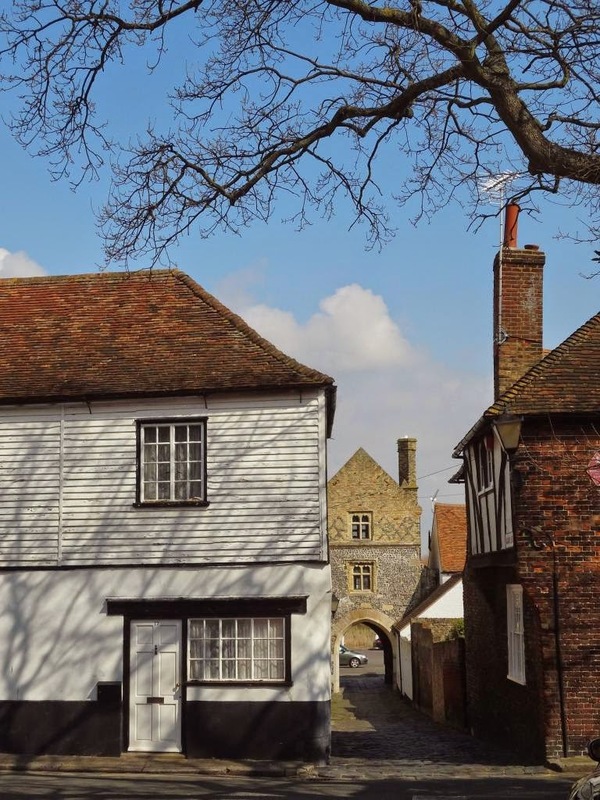 Eleventh-century Canterbury, especially during the reign of Edward the Confessor, was not so secure that it could afford to neglect its heavenly patrons. The ordination feast was probably introduced some time between the return of Alphege's body to Canterbury in 1023 and the Norman Conquest; it might be a legacy of Archbishop Æthelnoth the Good, who was responsible for bringing Alphege's relics back to the city he had left in 1011 as the prisoner of a Viking fleet. In the middle years of the eleventh century, some prayers for a variety of purposes were added to a splendid Psalter which had been made at Canterbury c.1012-23, which is now British Library, Arundel 155. These prayers, some 44 of them, are in Latin with an interlinear Old English gloss. 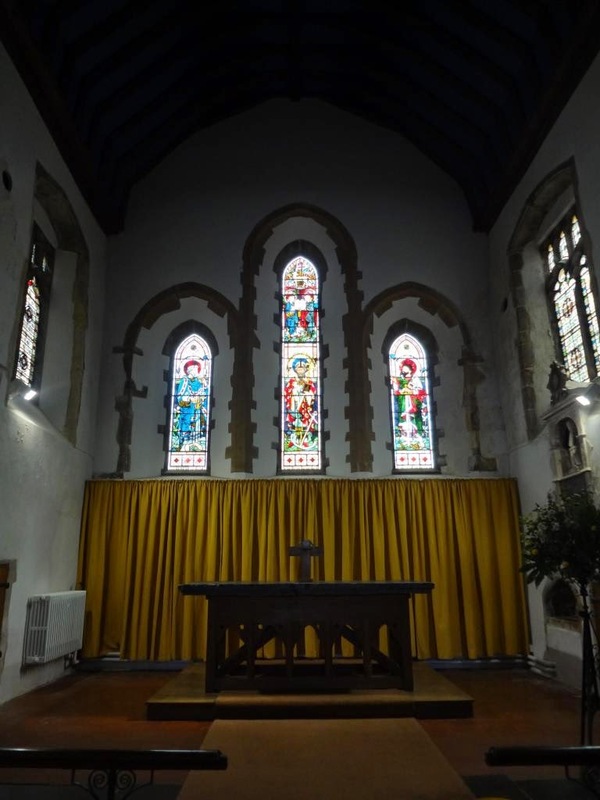 They've been published in two batches, the first group by Ferdinand Holthausen in 'Altenglische Interlinearversionen lateinischer Gebete und Beichten', Anglia 65 (1941), 230-54, and the rest by Jackson J. Campbell in 'Prayers from Ms. Arundel 155' Anglia 81 (1963), 82-177. Among these prayers are two addressed to Canterbury's chief saints, Dunstan and Alphege, and since I'm working on these saints at the moment I've made a translation of these prayers for my own use. I thought for St Alphege's (third) feast-day I'd post my translation of the prayer to the saint, though for the Latin and English text you'll have to search out Campbell's article. This prayer appears in ff. 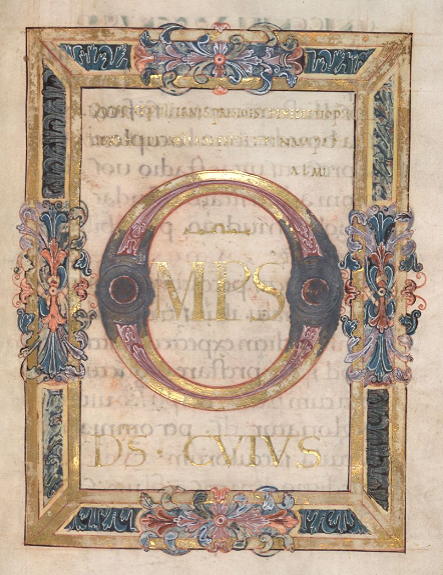 186-7 of the manuscript, pp. 95-9 in Campbell. There's one particularly interesting thing to note about this prayer. 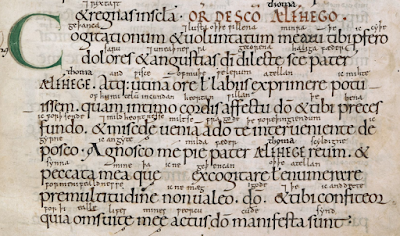 The name Alphege was naturally left untranslated by the person who made the Old English gloss, but more than a century later another hand came along and updated the prayer to adapt it for Canterbury's newest martyr - every instance of Alphege in the Latin was glossed instead with Thoma, for Thomas Becket. 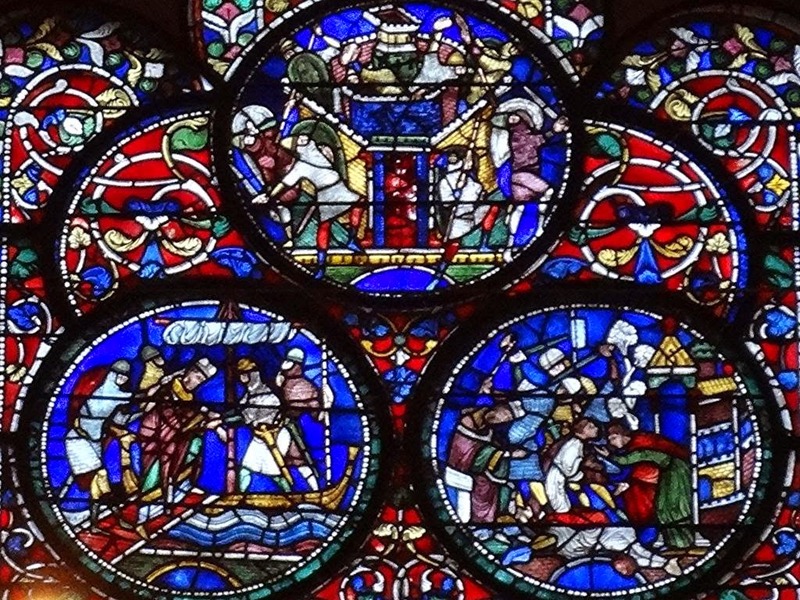 Becket himself apparently endorsed such a parallel between himself and the Anglo-Saxon martyr, when he spoke about Alphege in the sermon he preached on Christmas Day 1170, four days before his own martyrdom: "You already have a martyr here," he said, "Alphege, beloved of God, a true saint. The Divine Mercy will provide another for you; it will not delay." After Thomas' death it would have seemed natural to the monks to link Canterbury's two martyrs by reusing a prayer to the earlier saint. 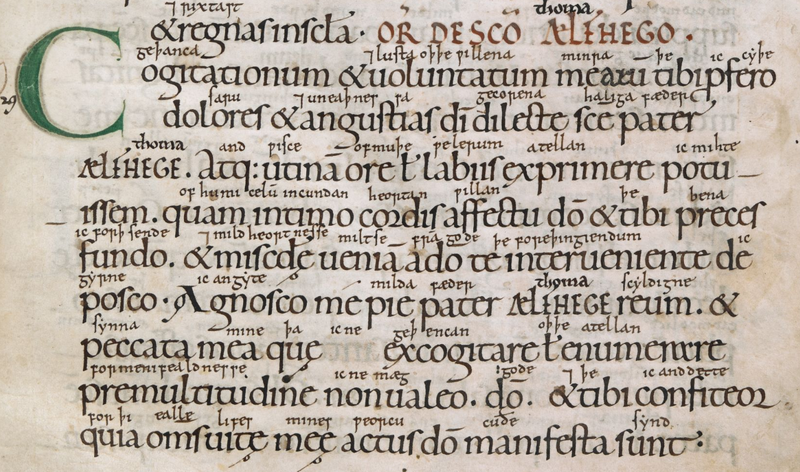 So this is a multi-purpose prayer, and a good example of an Anglo-Saxon manuscript which continued to be in use for a long time after its English glossing would have become archaic. My thoughts and my desires I make known to you in sorrow and anguish, beloved of God, holy father Alphege. I wish that I could express with mouth or lips how in my inmost heart I pour out prayers to God and to you, and crave merciful pardon from God through your intercession. I know myself to be guilty, gracious father Alphege, and my sins to be more numerous than I can bring to mind or count. To God and to you I confess, therefore, all my life's deeds, which are known to God, and which I cannot conceal or amend, if not for the grace of God and, St Alphege, your interceding mercy. Holy father Alphege, wicked is my life in the sight of God, stained is my soul with wrongful thoughts and all vices of sins, at the guilt of which my own conscience is offended. Far from me are truth and mercy, if it were not that he, the Saviour of mankind, coming down from the heavens, forbade despair and promised forgiveness to sinners. Long ago he would not suffer delays in the destruction of my weakness, that I fall not into despair. But because it is good to hope in the Lord, and blessed are all they who trust in him, with mind and with body, prostrate before God and you, with humble devotion I crave your merciful protection, holy father Alphege, that, with strength and honour greatly shining forth on earth, through your intervention in heaven you reconcile me, your servant, with God, and redeem me from all sins by your gracious intercession. O noble father Alphege, jewel of bishops and glorious beauty of Christ Church, hear sinful me humbly praying to you, and unceasingly plead for my offences to the blessed Saviour. Holy father Alphege, implore the Lord that he keep far from wretched me sinful lusts and wicked desires, and turn wrongful thoughts away from me, and deliver me from every pollution of the devil and his ministers, that I may become worthily pleasing to God, and fittingly perform this with all love for God and for you. I pray also through you, holy father Alphege, to all the blessed host of saintly martyrs, who by their steadfast faith and shedding of their blood have achieved heavenly rewards, that supported by the protection of so many saints in this present life I may leave and shun all things which are harmful to the body and the soul, and love Christ entirely with a pure mind, and steadfastly endure in the Lord's commands. And, thus enduring, intercede for me, holy father Alphege, that Christ the Lord may grant that I may deserve to come to eternal bliss, where health, life and joy endure for all those beloved of God, through all ages of ages. I particularly like the last section here, where the petitioner asks for grace to steadfastly perseverare 'endure, continue' in God's commands (þurhwunian is the Old English word), so that he may come to the place where salus, vita et felicitas (hæl, lif and gesælhþ) perseverat, þurhwunaþ, endure for ever. By way of comparison, this is the prayer to St Alphege with which Osbern concludes his Life of the saint. Alphege, great soldier of a great King, who washed your robe in the blood of Almighty God, accept the prayers of the sons who cry to you, and by your gracious intercession raise up those whom you have honoured by your holy Passion. Made strong by divine assistance, you overcame the prince of death; father, strengthen us against him, and help us to vanquish him. You had mercy on those who stoned you; have mercy on those who pray to you, that the fury of those who rave may not gain more than the devotion of those who love. Do not let your servants know the gates of death and hell, but bring them to the gates of Paradise through the power given to you by the Saviour, who lives and reigns together with the eternal Father and co-eternal Spirit, the one, only, true God, through endless ages of ages. Amen.